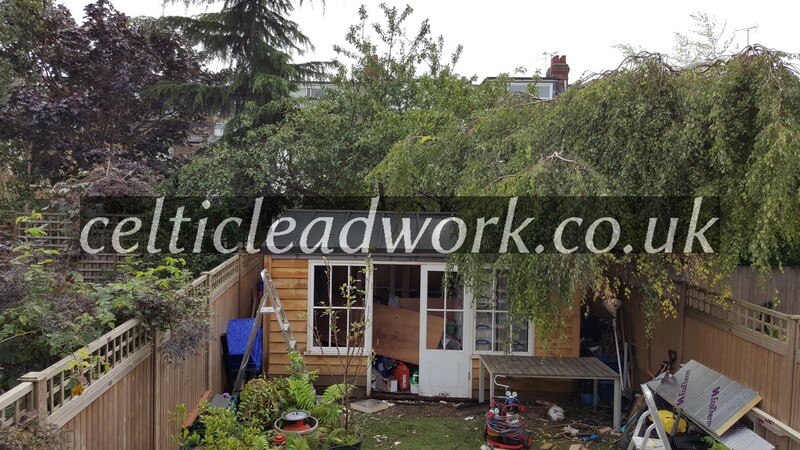 North Ealing, London. 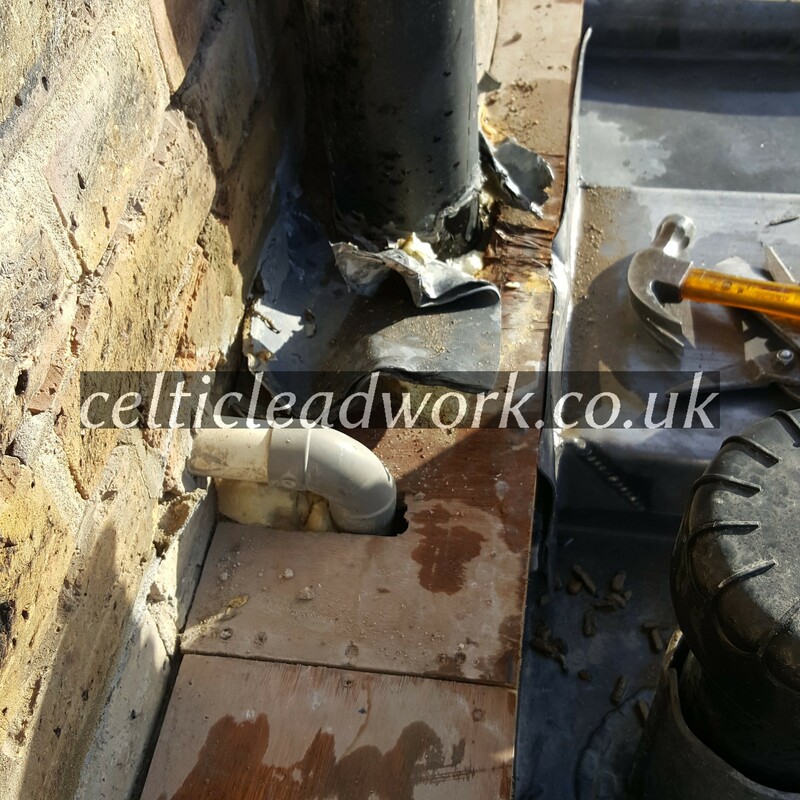 Rectifying previous contractors work that was poorly installed and leaking. 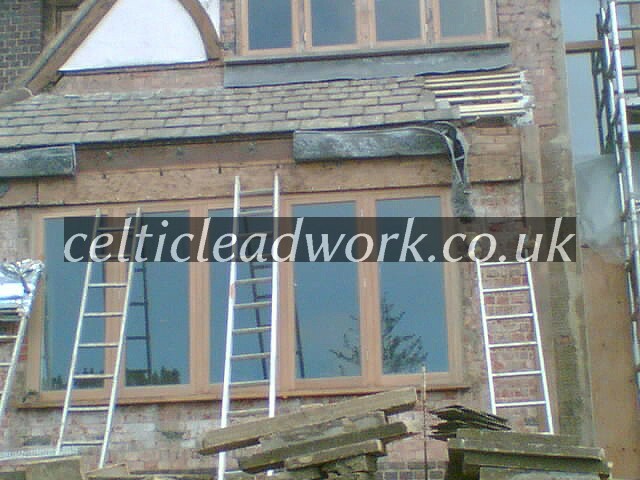 Vented, code 8 lead bays to conservatory extension. 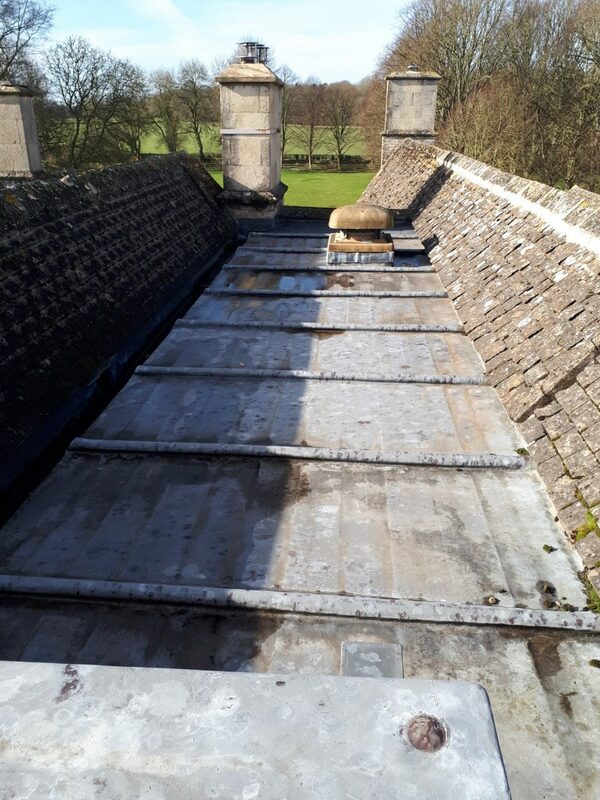 Manor House, Gloucestershire. 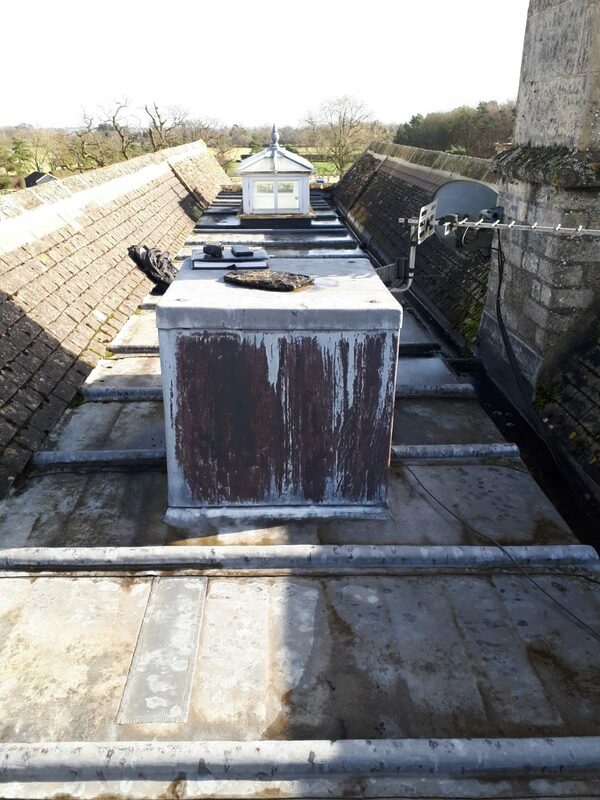 Replacing original 1930s, code 6, old lead roof. 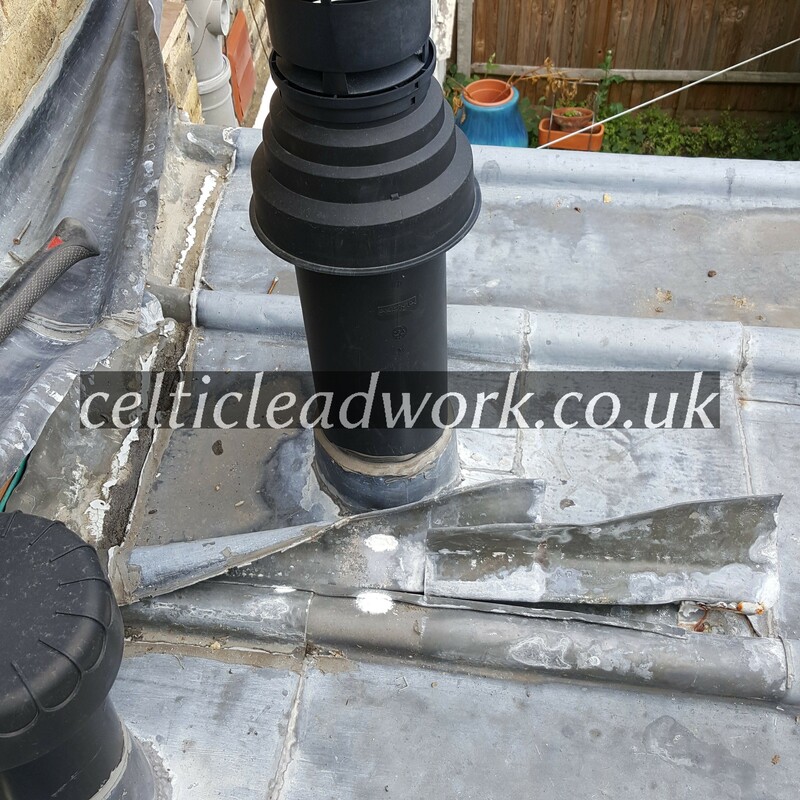 Failure due to over fixing and over sized bays. 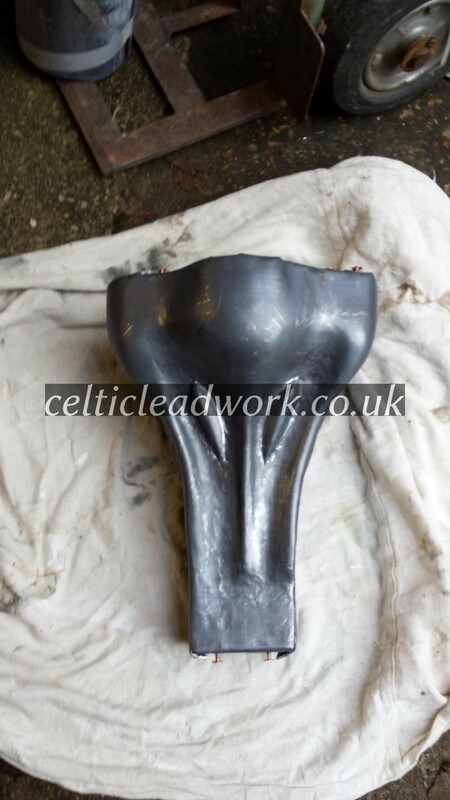 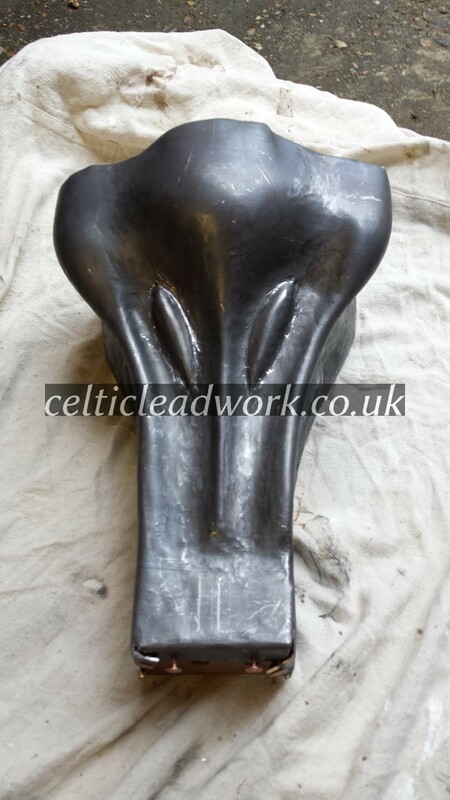 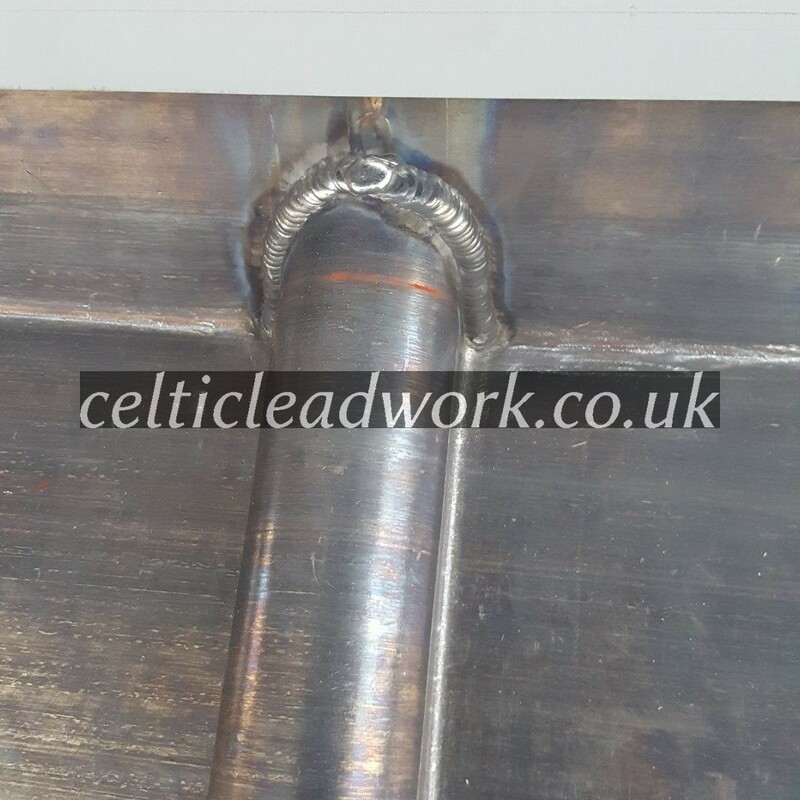 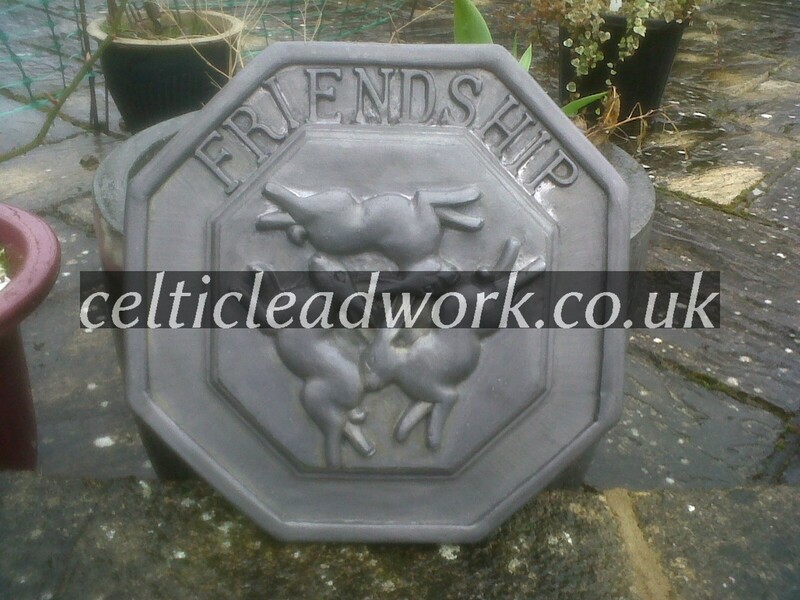 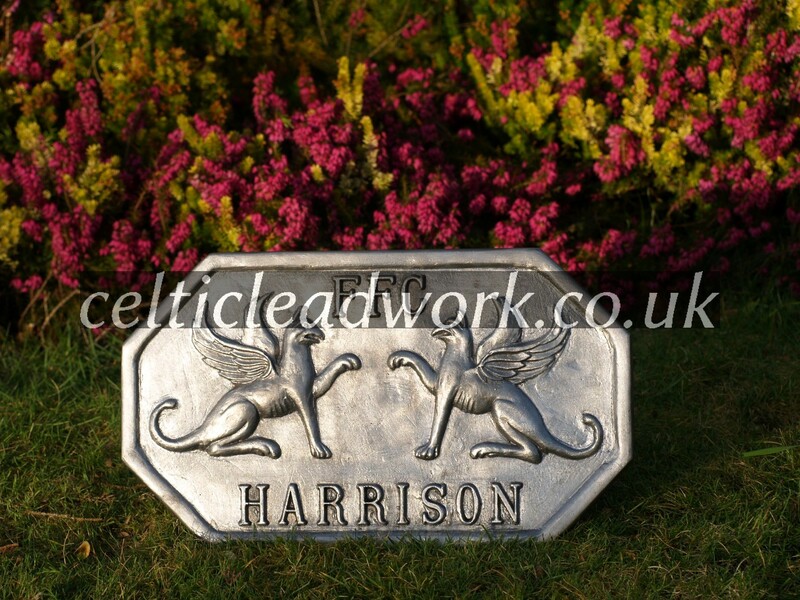 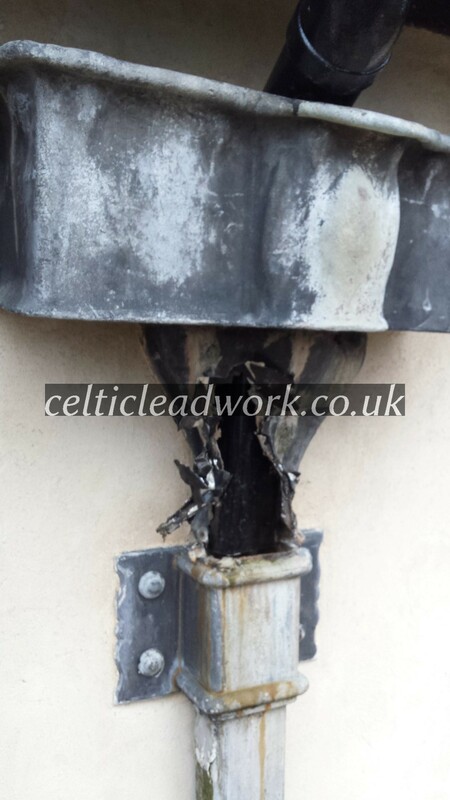 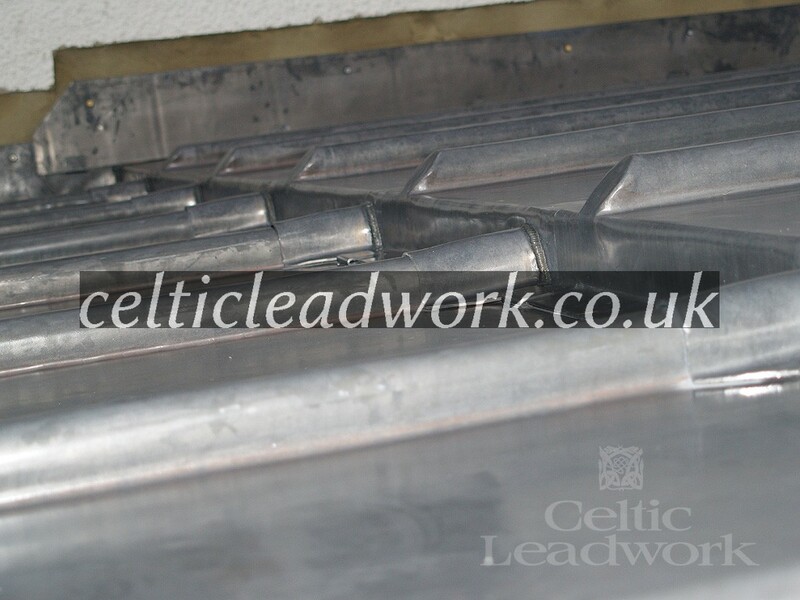 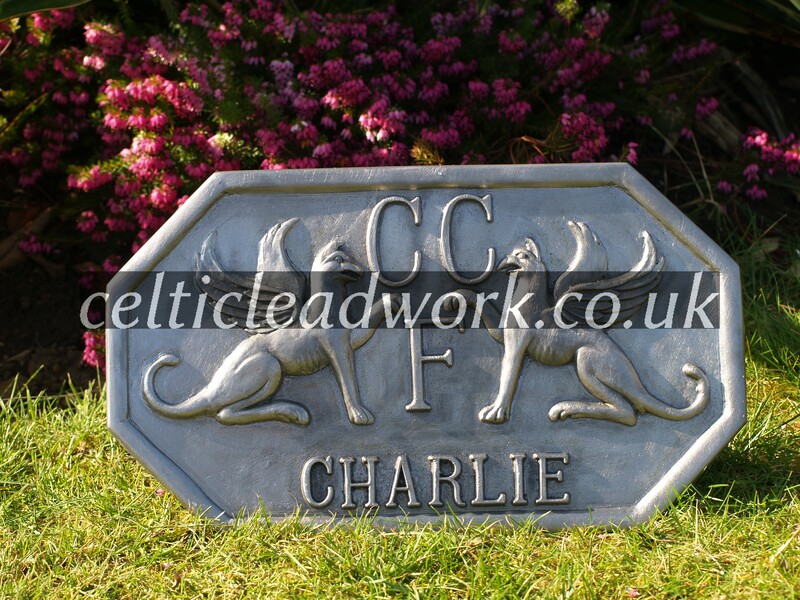 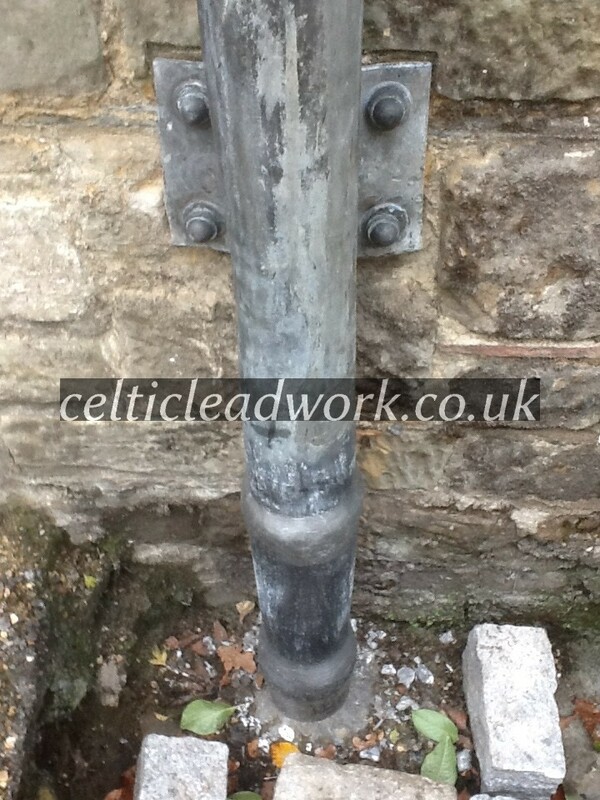 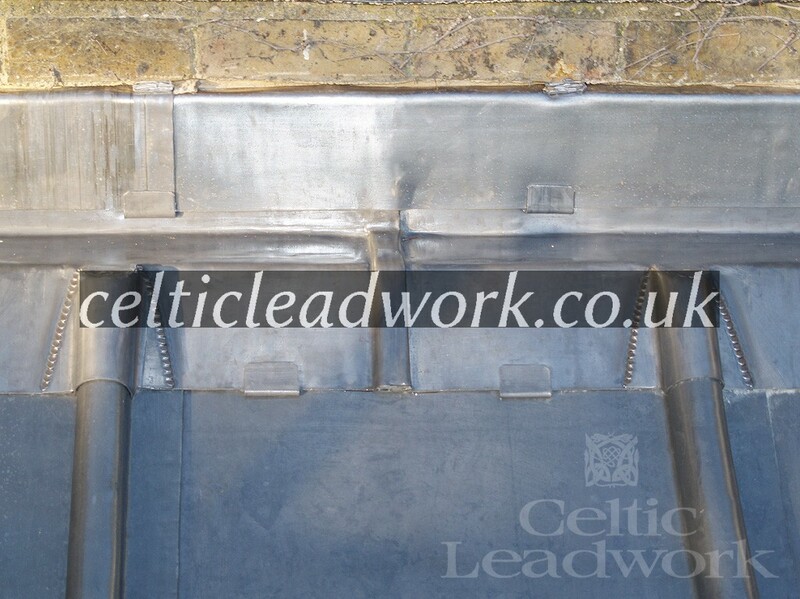 AFTER – Replaced with code 7 and sand cast lead, refitted to Lead Working Practice Guidelines (LSA) Lead Sheet Association. 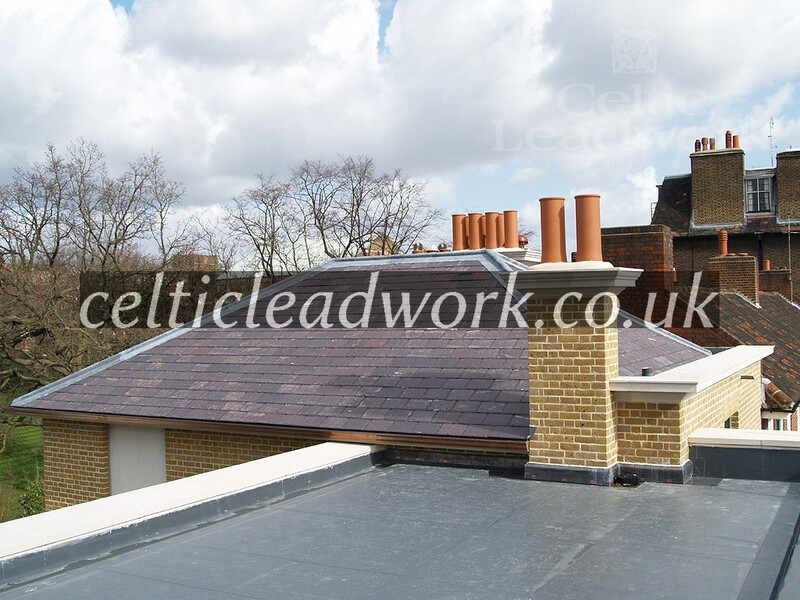 Barnes, South West London. 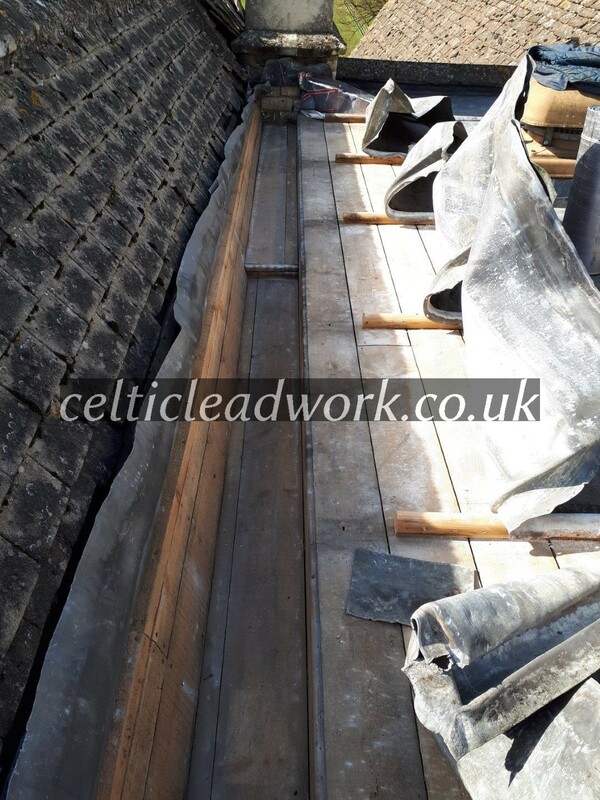 Overall winners of the 2018 Murdoch Sponsors Award, presented by the Lead Contractors Association.Fully vented, code 6 flat bays with vertical code 5 wood core roll panels and code 5 welted panels. 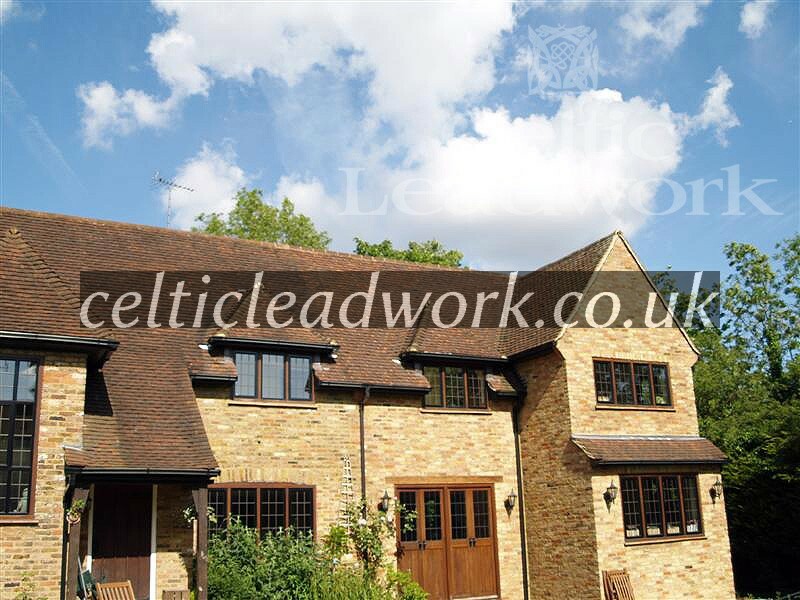 Chorleywood, Hertfordshire. 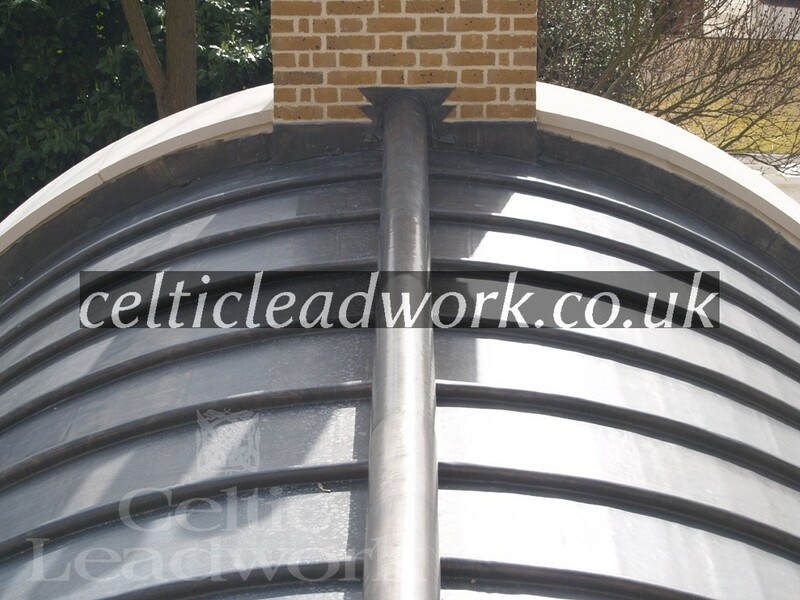 Rosemary tiles bonnet hips with lead dormer window. 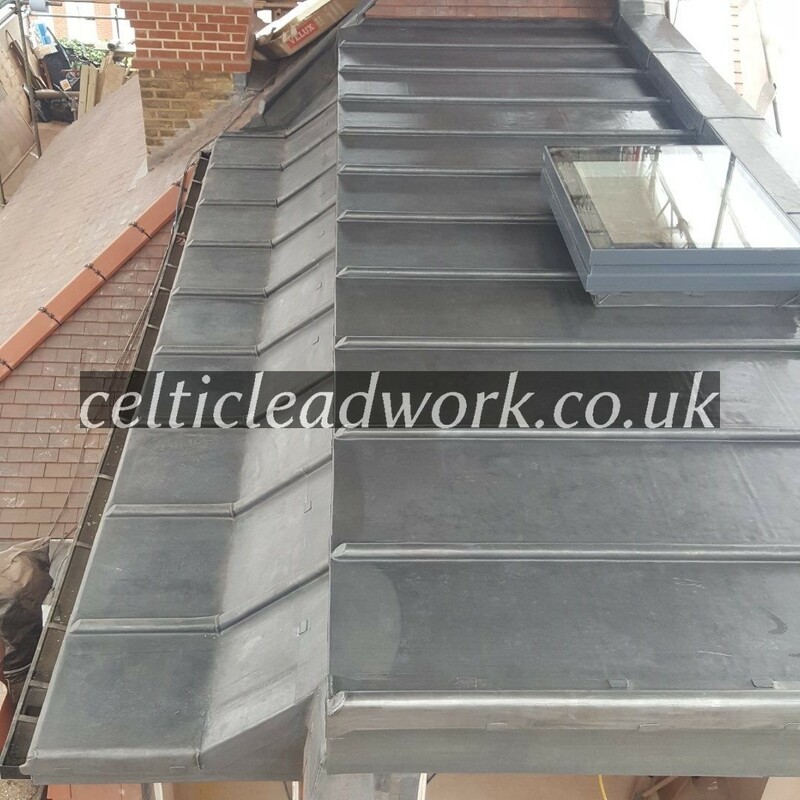 Fully vented, Code 5 lead flat roof, Bossed roll ends & welded caps, with code 5 vertical lapped panels, fitted to Z trim to stop wind lift. 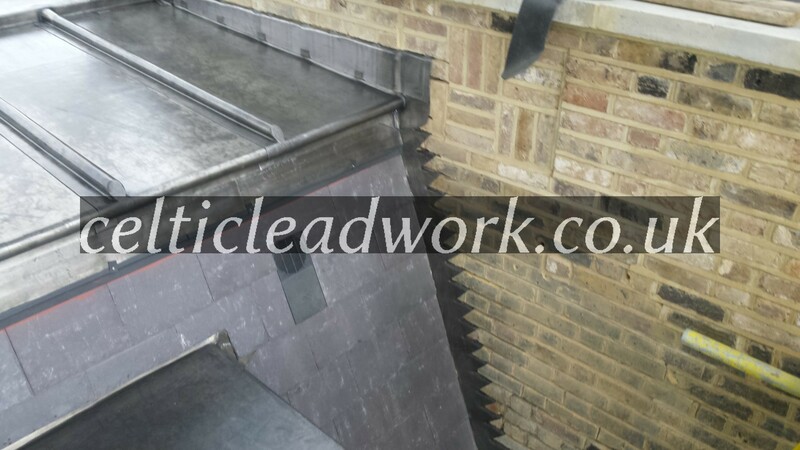 Westbourne Grove, West London. 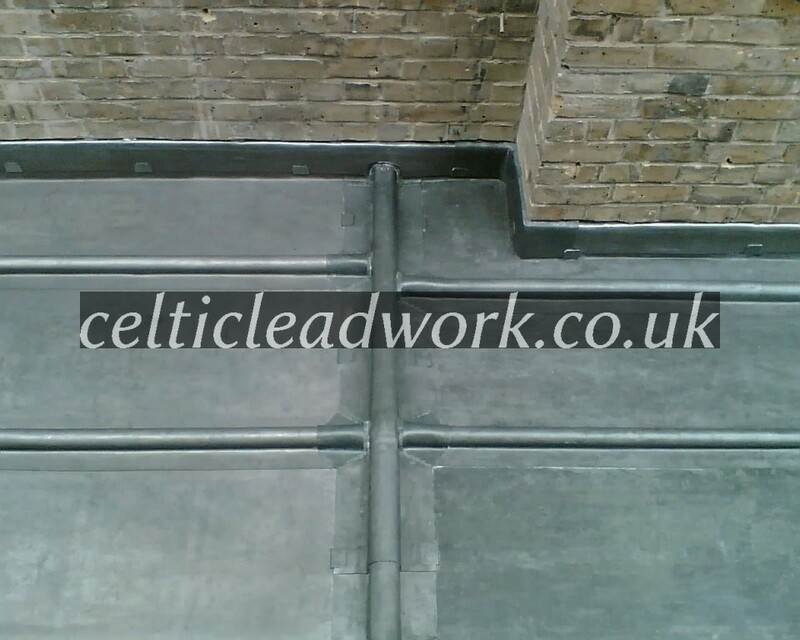 Fully vented Code 8 lead flat roof rear extension. 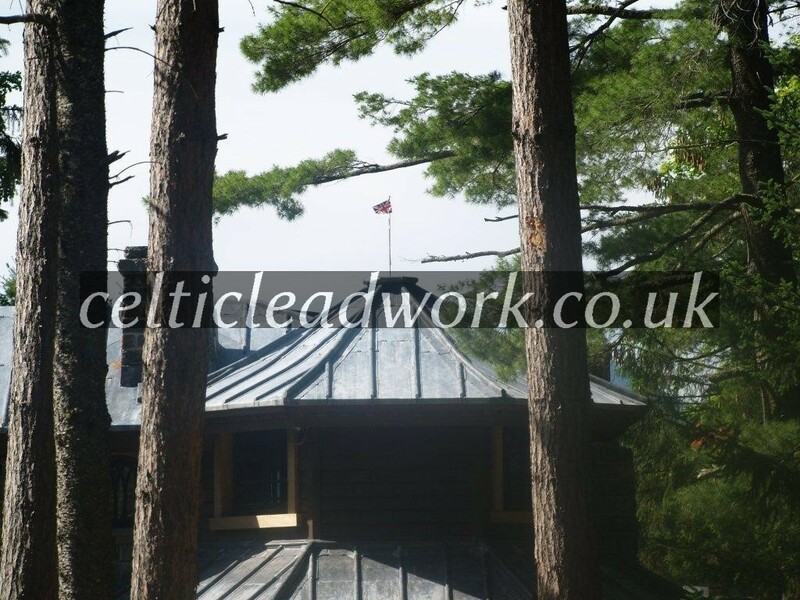 Code 6 pitched lead roof Fully vented, Timber cabin with copper gutters, & king wood roll, ridge detail with lead welded caps. 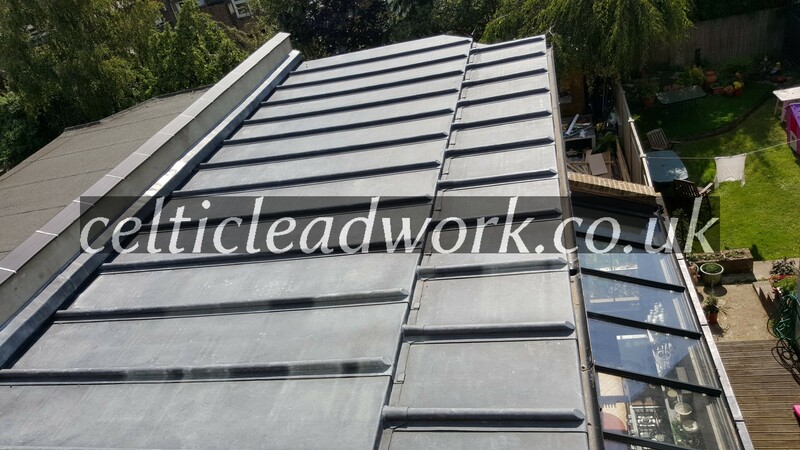 Nottinghill West London. 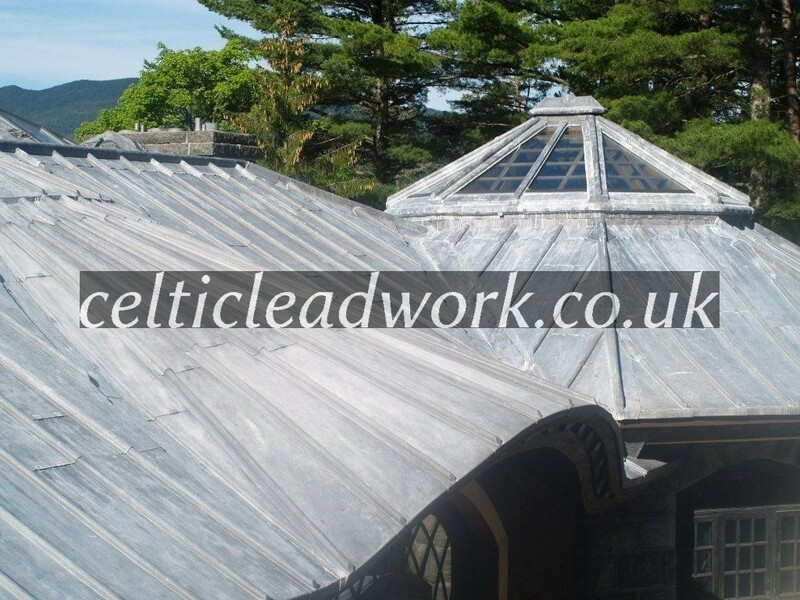 Overall winners of the 2016 Murdoch Sponsors Award, presented by the Lead Contractors Association. 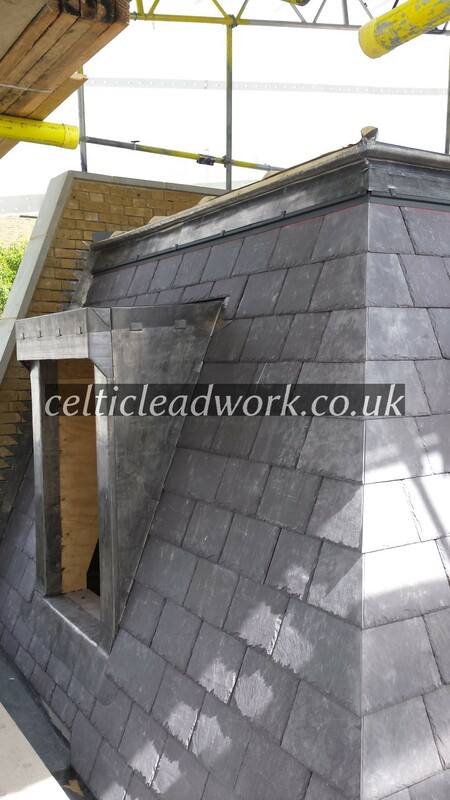 Natural welsh slate mansard with mitred hips, Code 5 dormers. 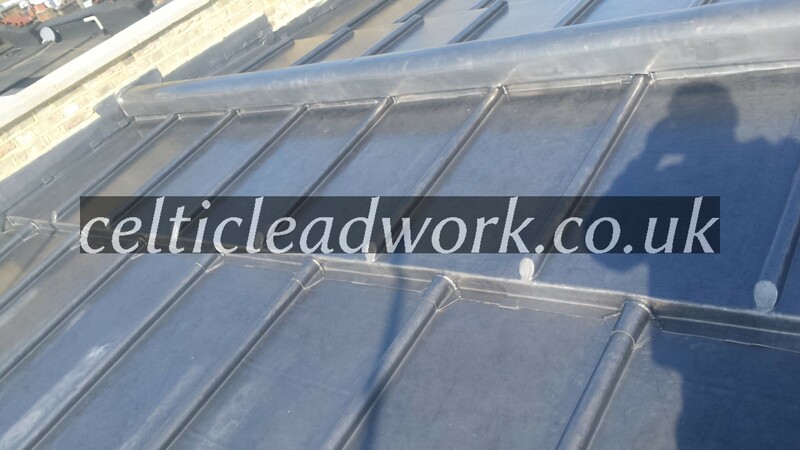 Code 8 Gutters. 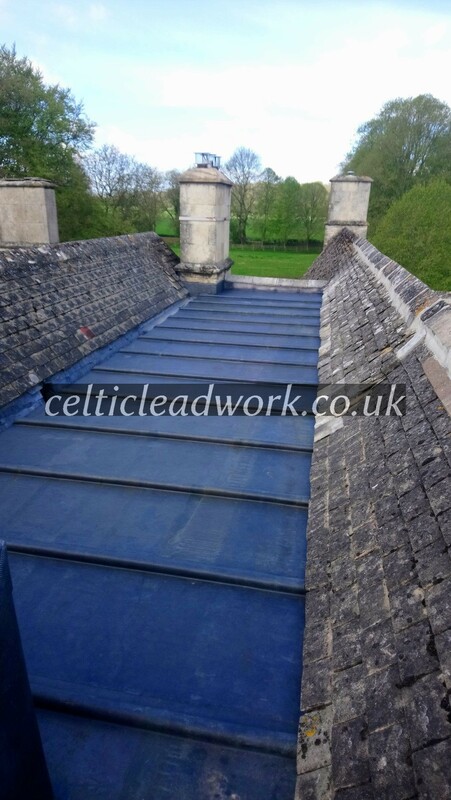 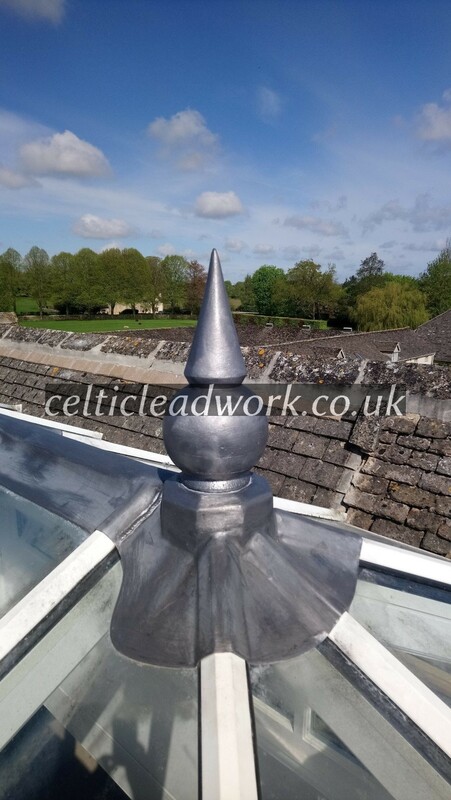 Fully vented code 5 lead crown roof. 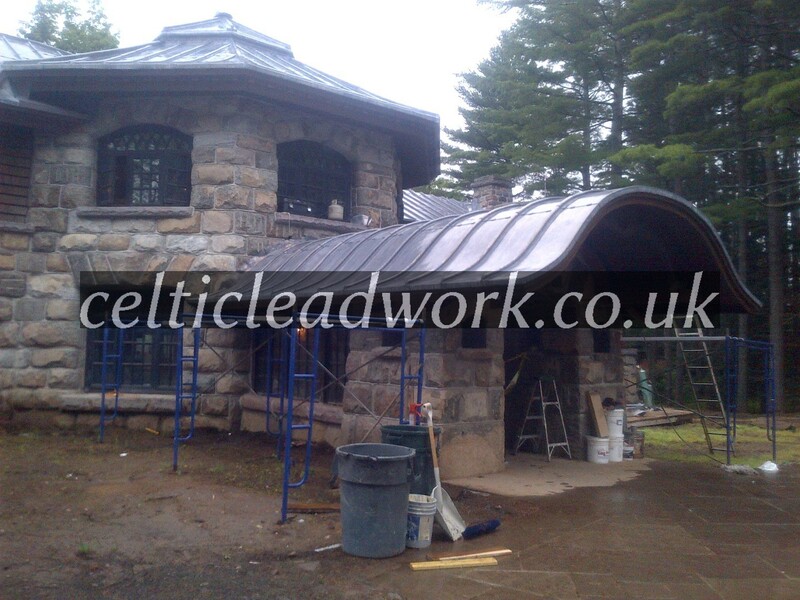 Over seas Project USA. 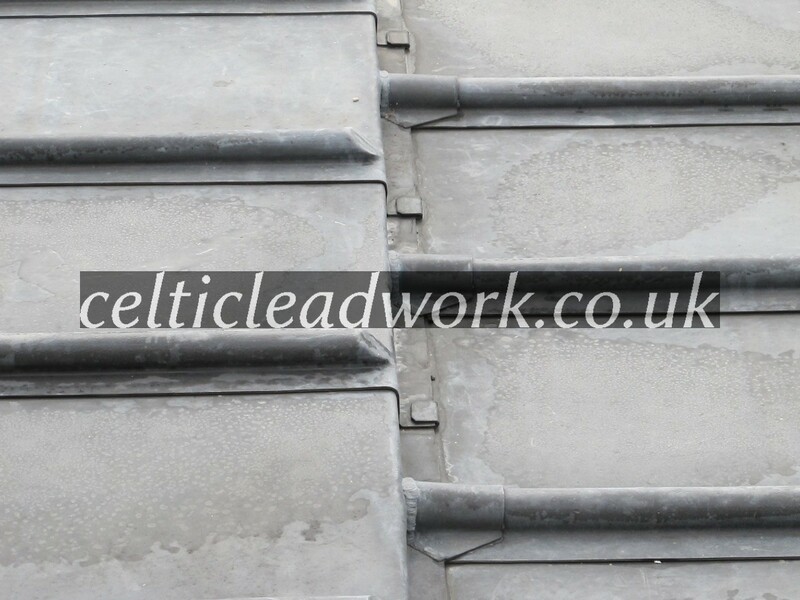 Code 8 lead used, unoiled due to weather conditions, this shows natural weathering Patination. 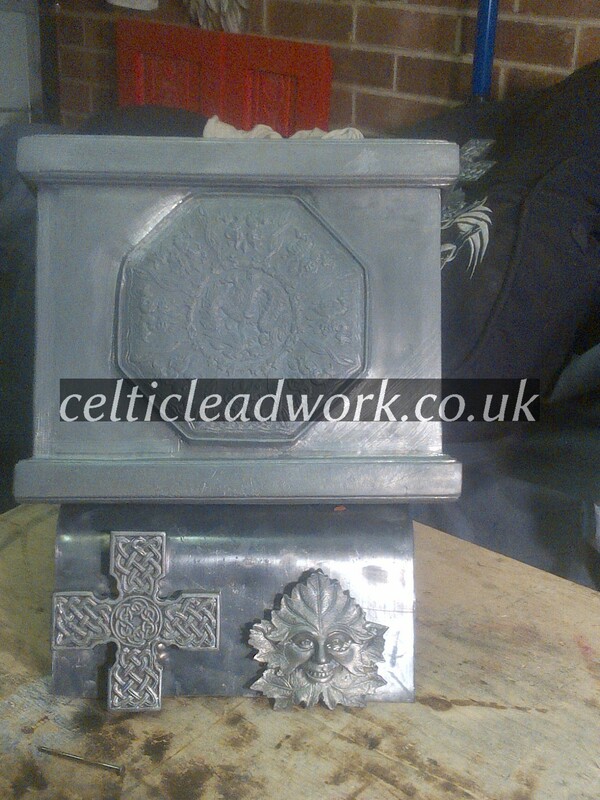 White patina will wash off over time. 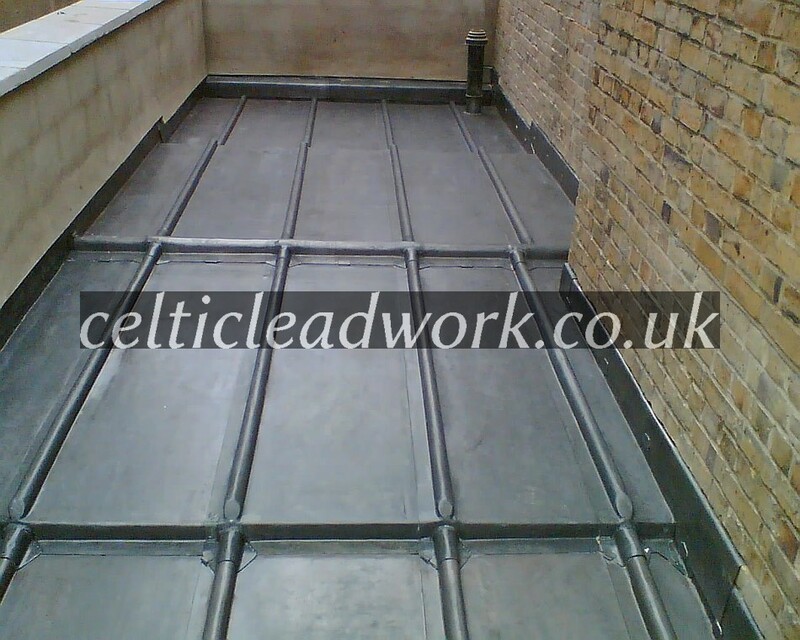 Flat roof. 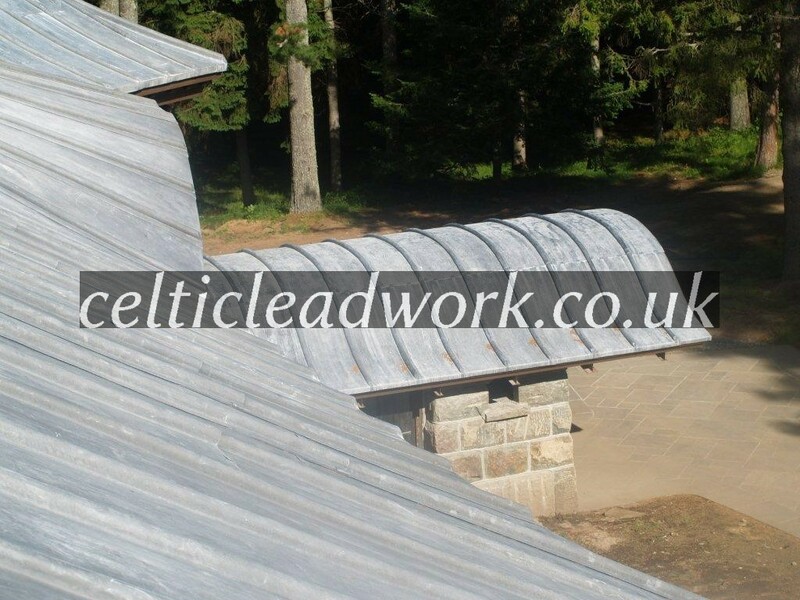 Triangular flat roof intersecting with a pitched roof, also interconnected to a small raised eyebrow. 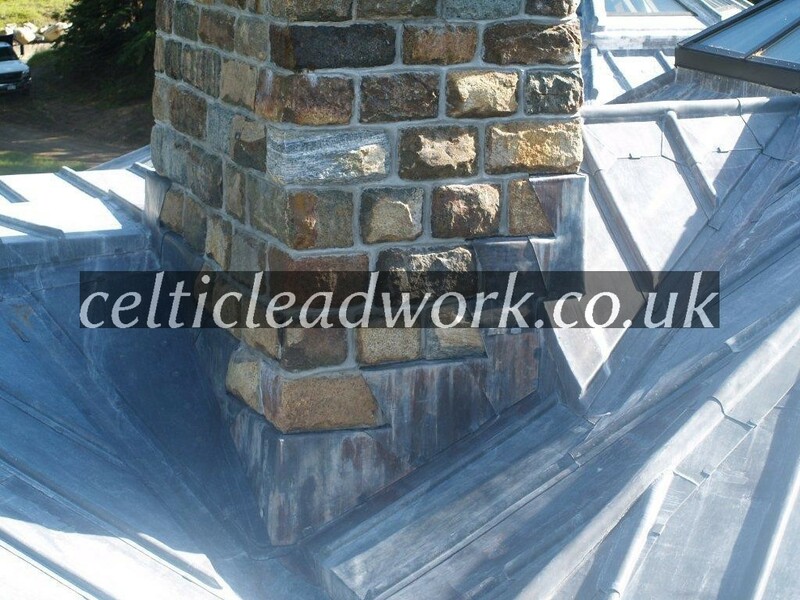 Step flashing to stone chimney & valley gutter detail, with king wood roll ridge & Hip detail. 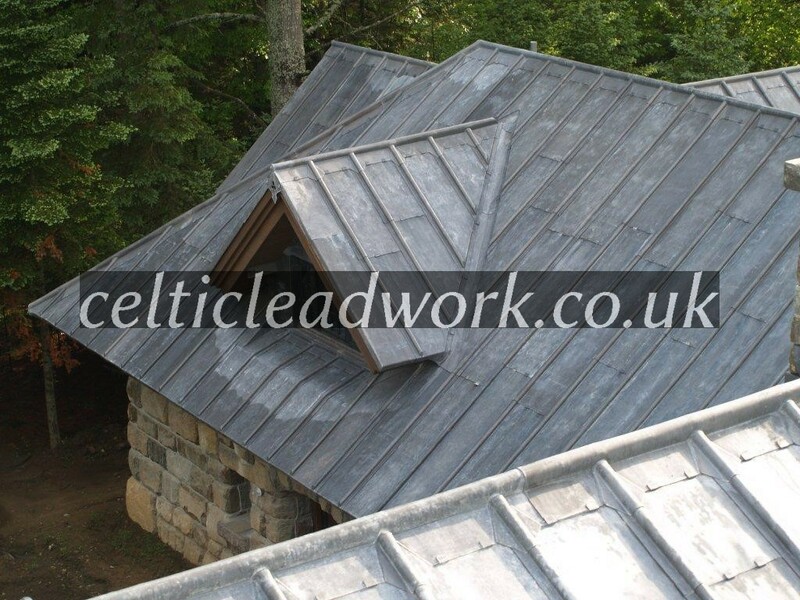 Eye brow & pitched mansard roof. 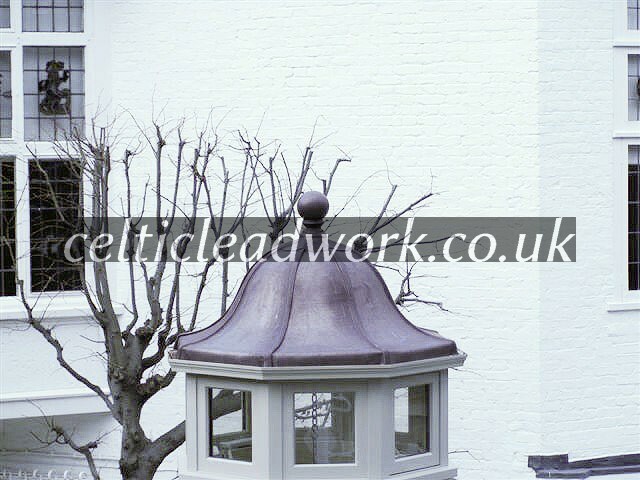 Barrel roof with standard wood roll. 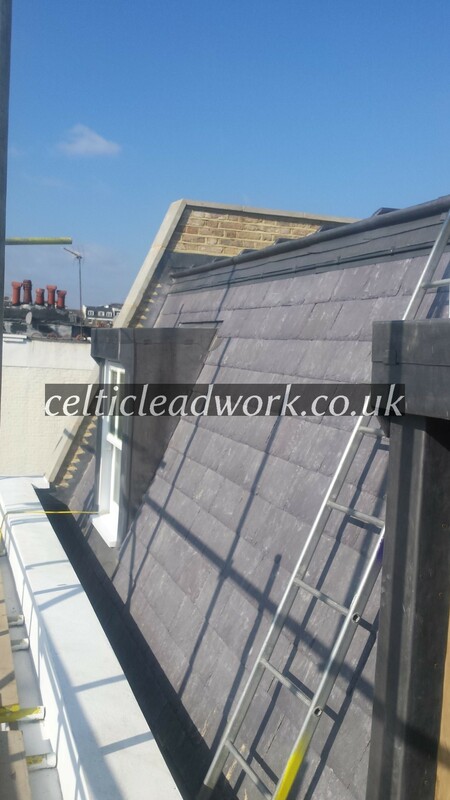 Vertical Mansard roof ,with dormer detail, & king wood roll ridge detail. 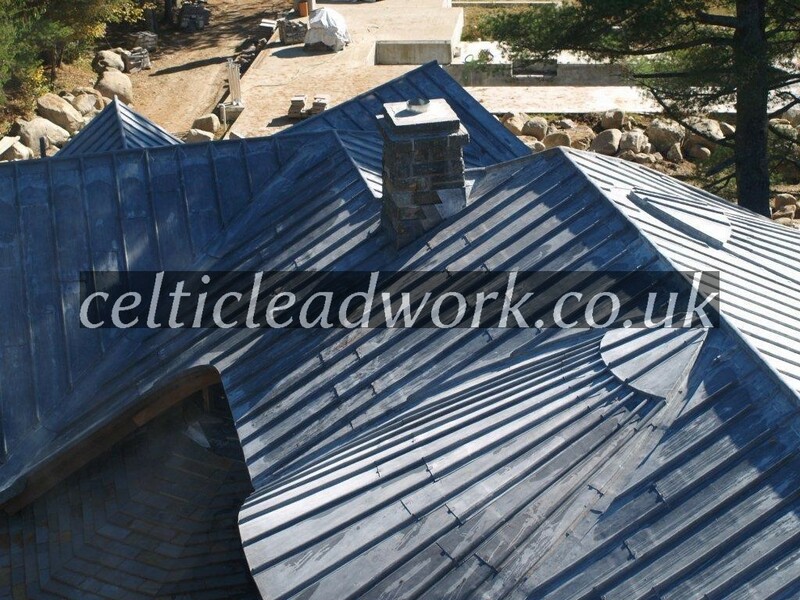 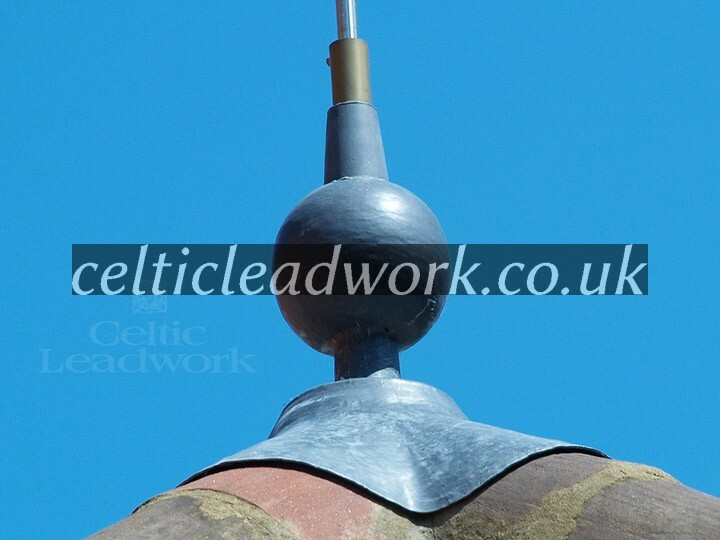 Conical vertical lead roof with king wood roll ridge detail. 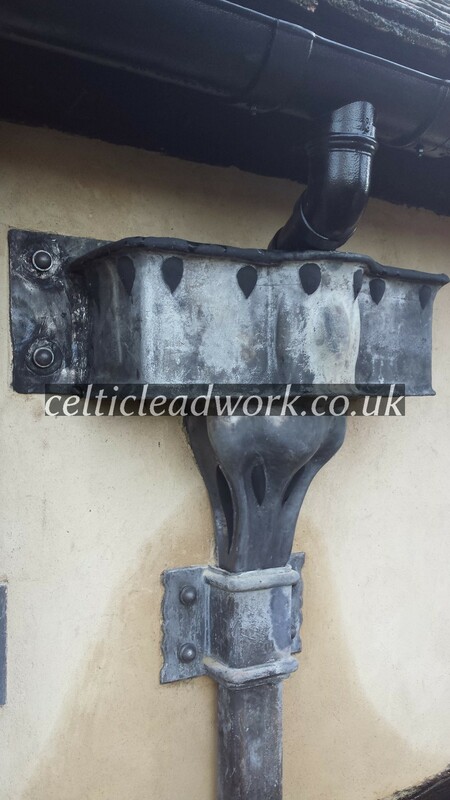 With chimney back gutter. 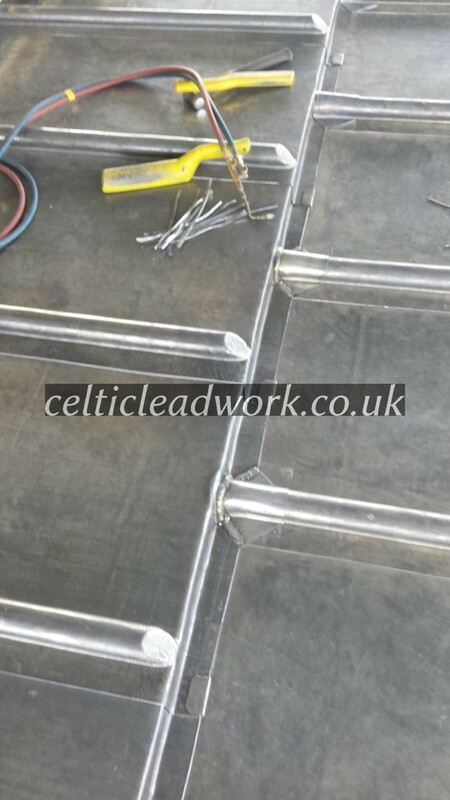 Glass roof light with king roll hips. 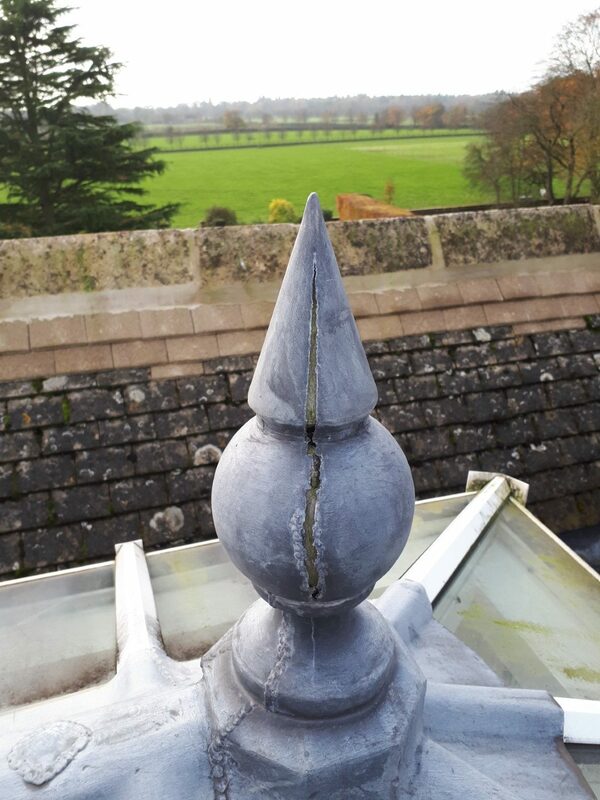 Tower roof, ready to take a spire, with lead valley gutter detail. 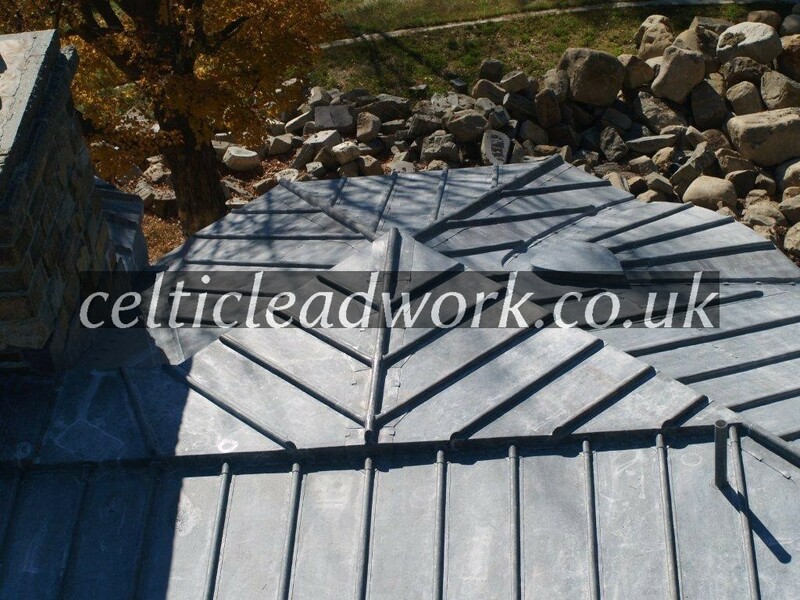 Intersection pitched roof detail with lead valley gutters & lead vent pipe. 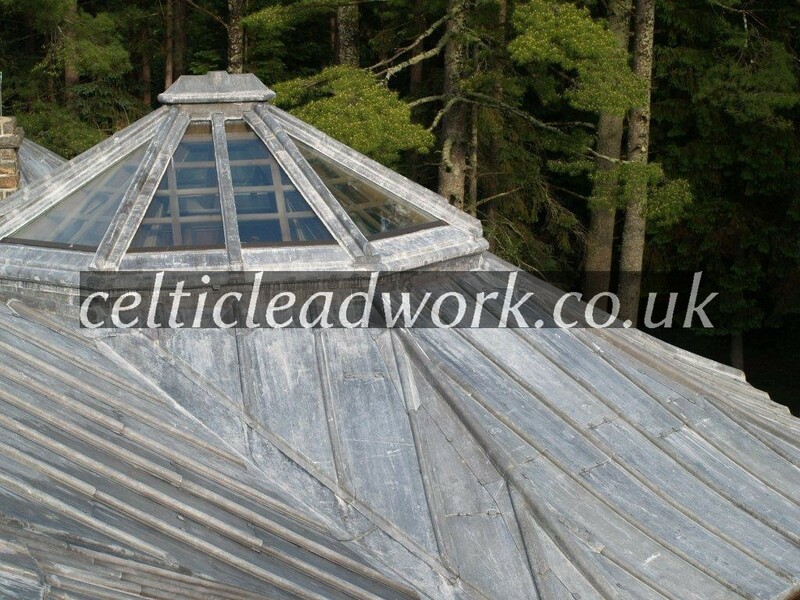 Work in progress main roof. 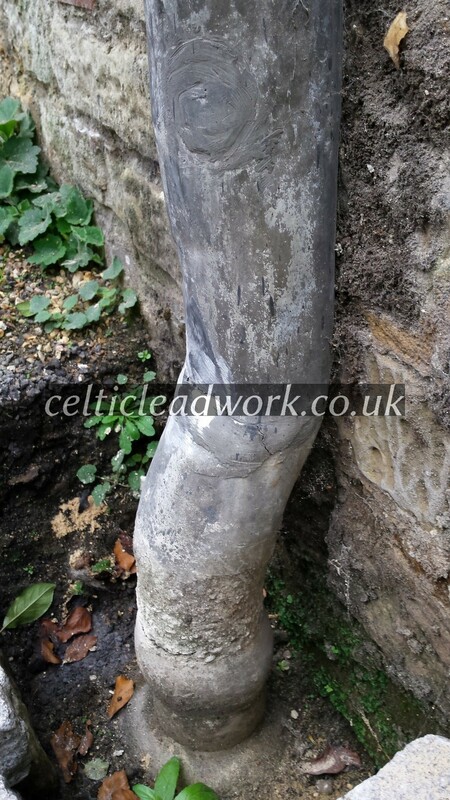 Rain water Hopper repair before & after. 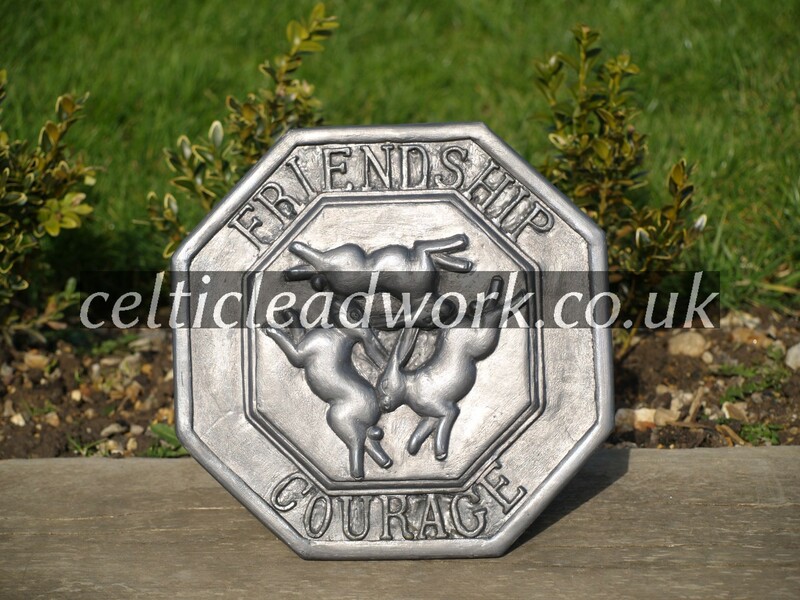 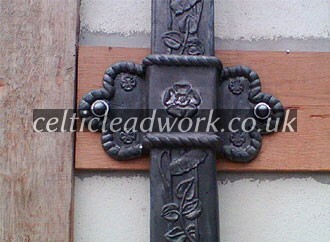 Made from recycled scrap lead. 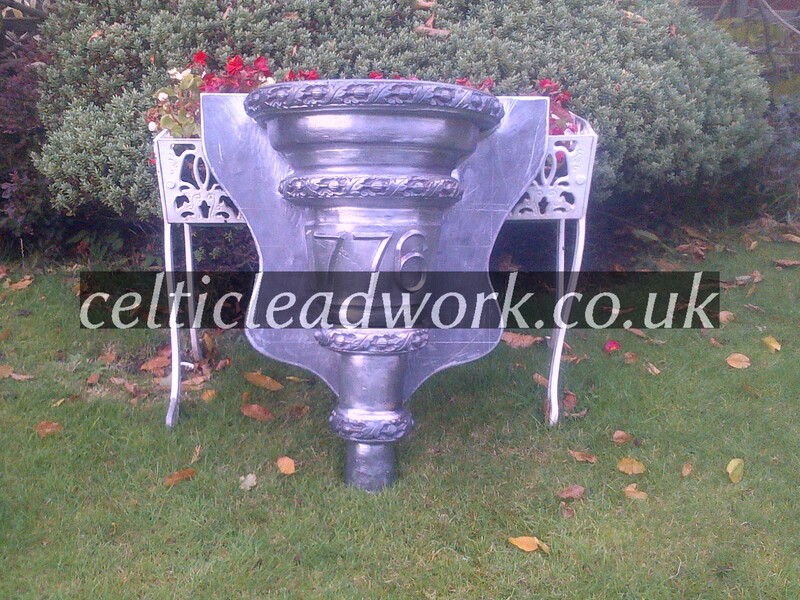 A bespoke Rain water hopper, flower pot, as a wedding present. 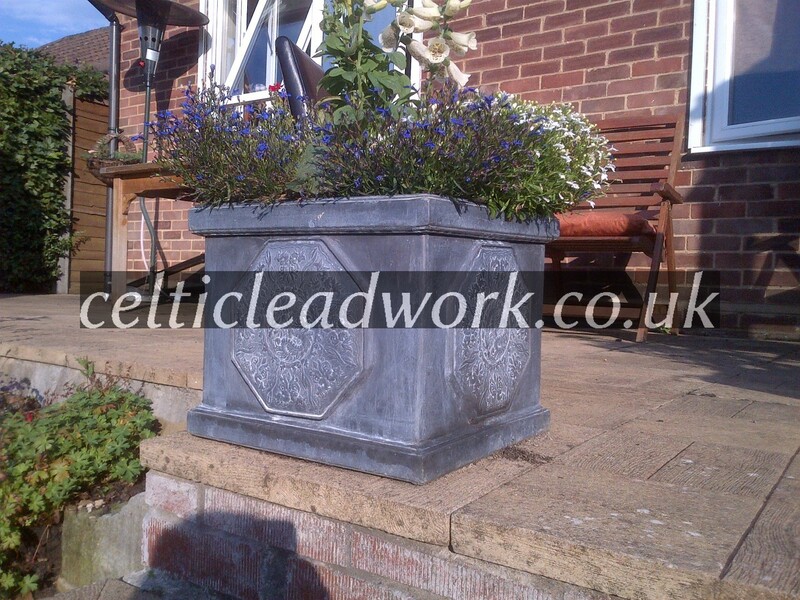 Made from recycled Scrap lead, Flower pots, name plagues & Motifs. 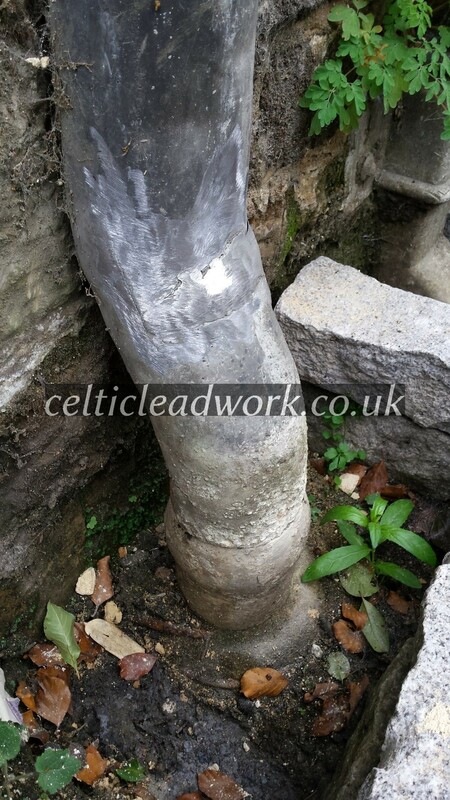 Lead pipe wiped joint repair before an after. 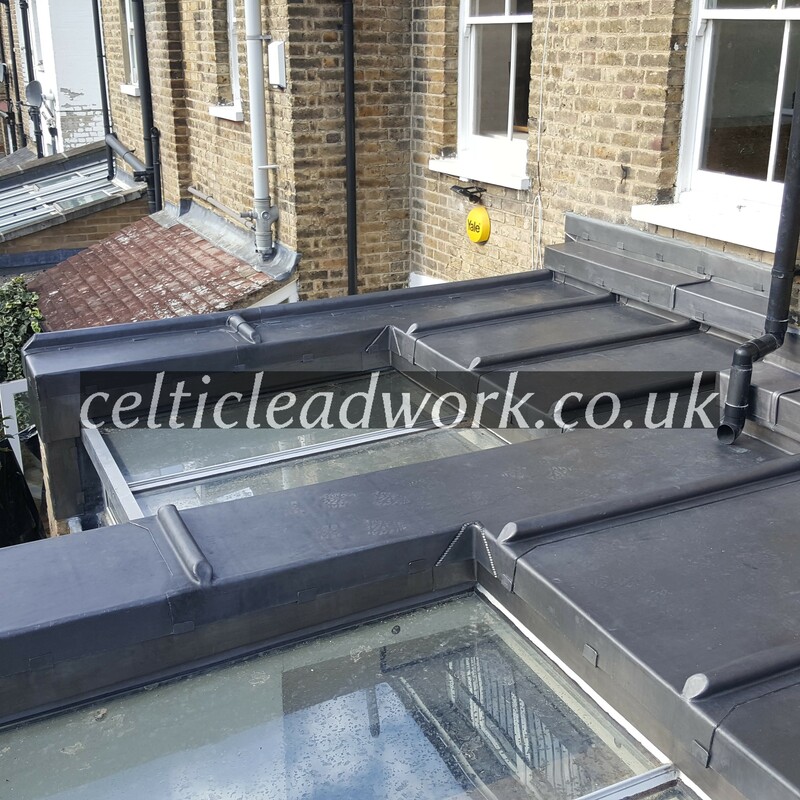 Barrel roof – code 8 and 6 South Edwards Square, Kensington, London. 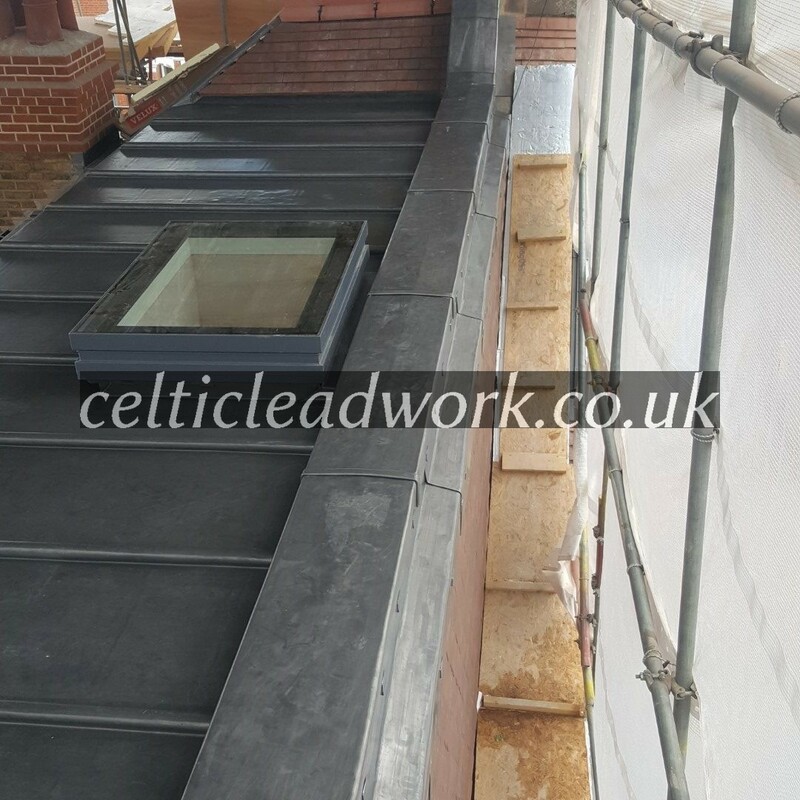 New build annex roof over a dinning room. 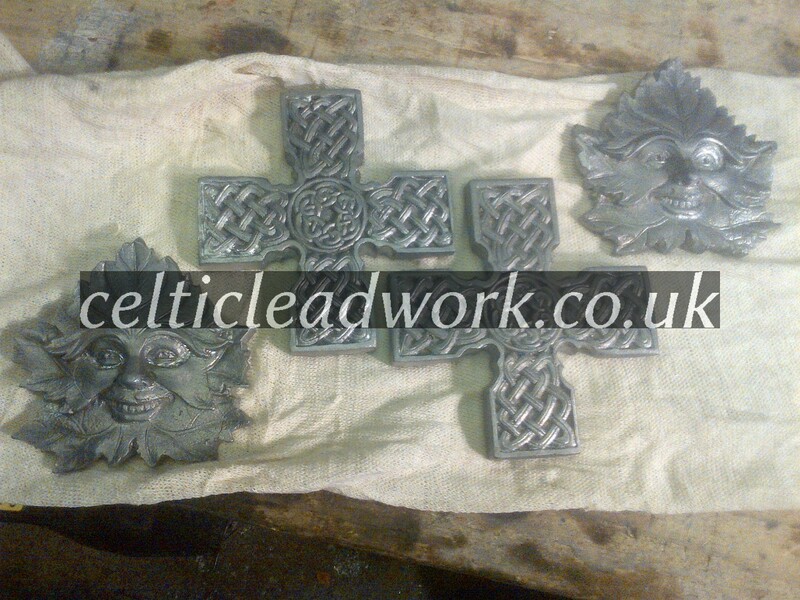 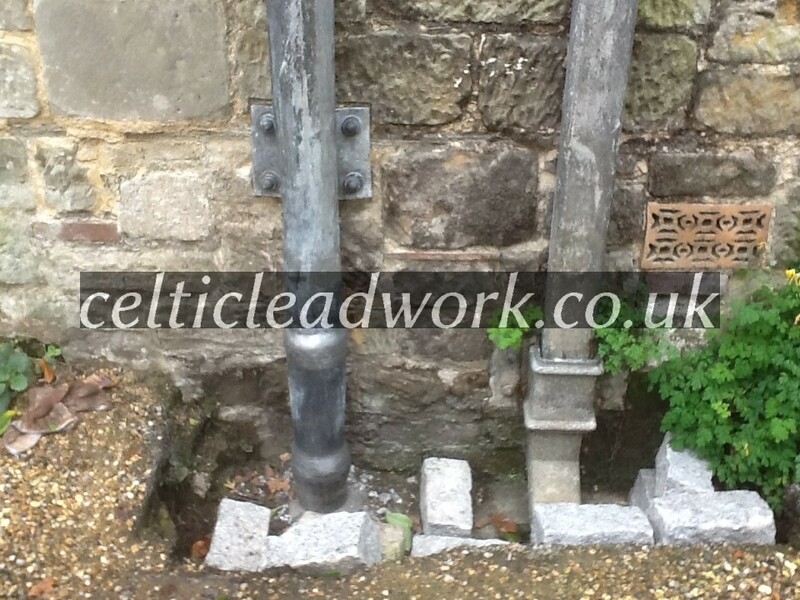 Cast lead work – sand cast lead Private House, Wimbledon, London. 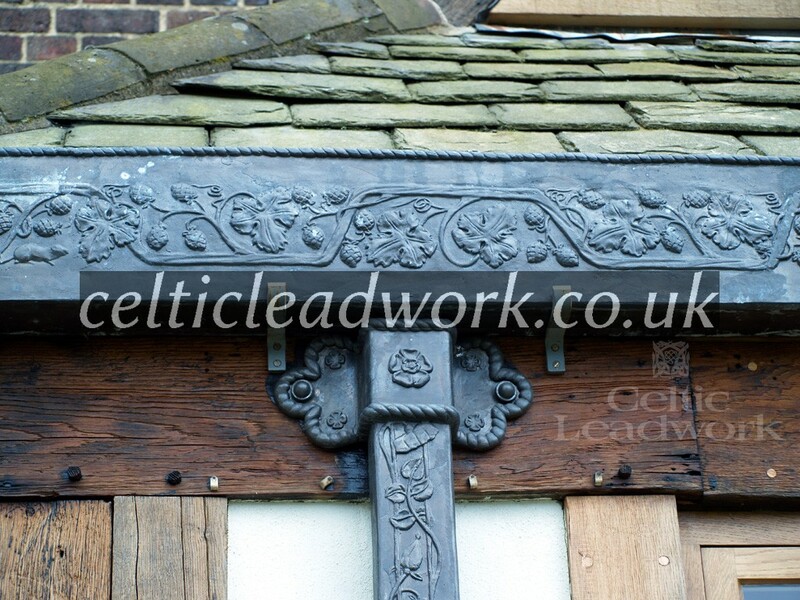 Refurbishment and repair work, detailed ornament reconstruction. 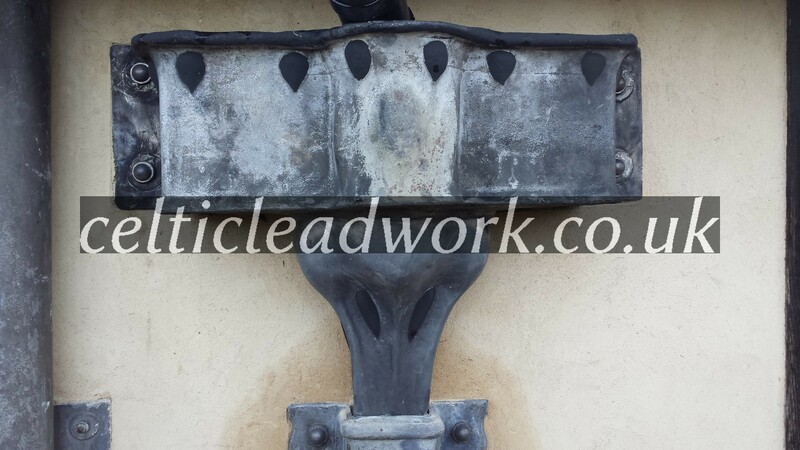 Salvaged original features, and sand-cast reconstructed the parts beyond repair. 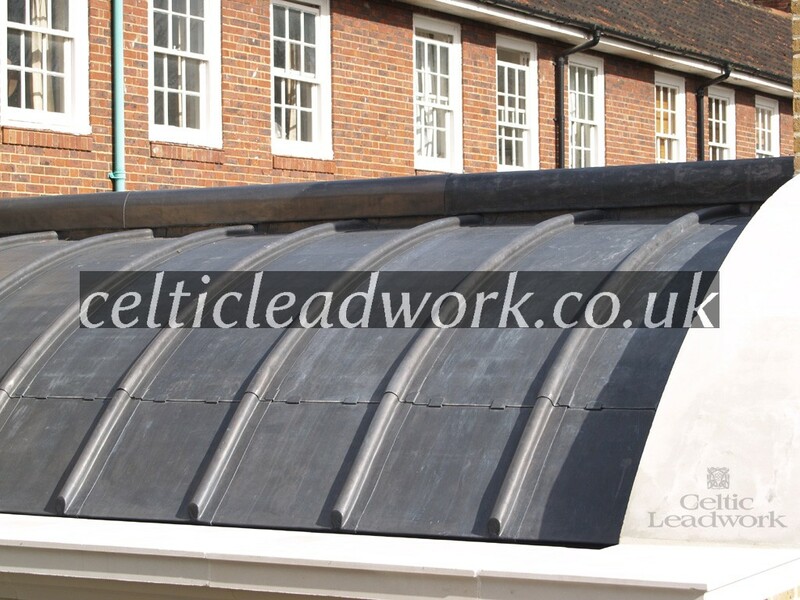 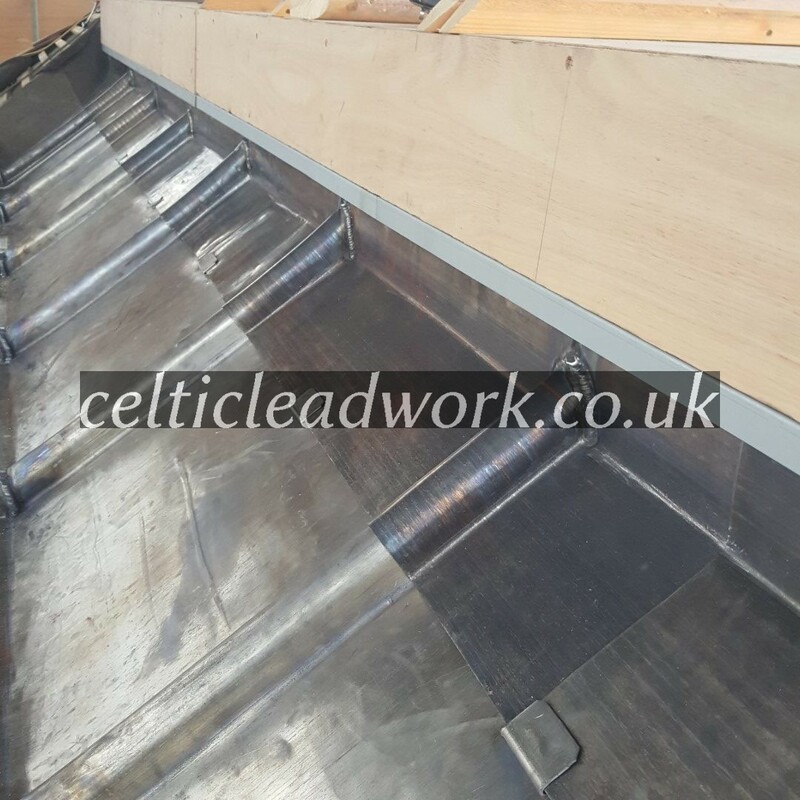 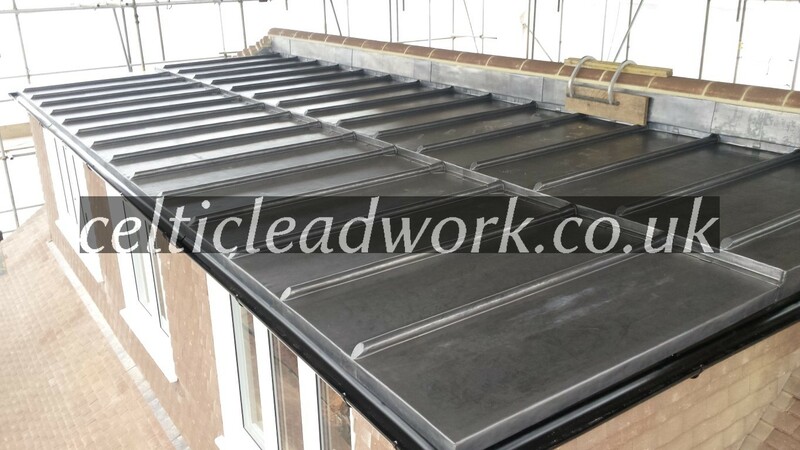 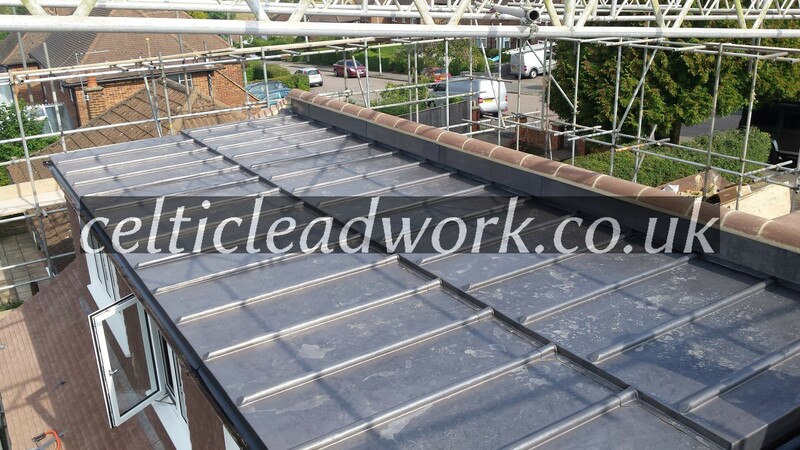 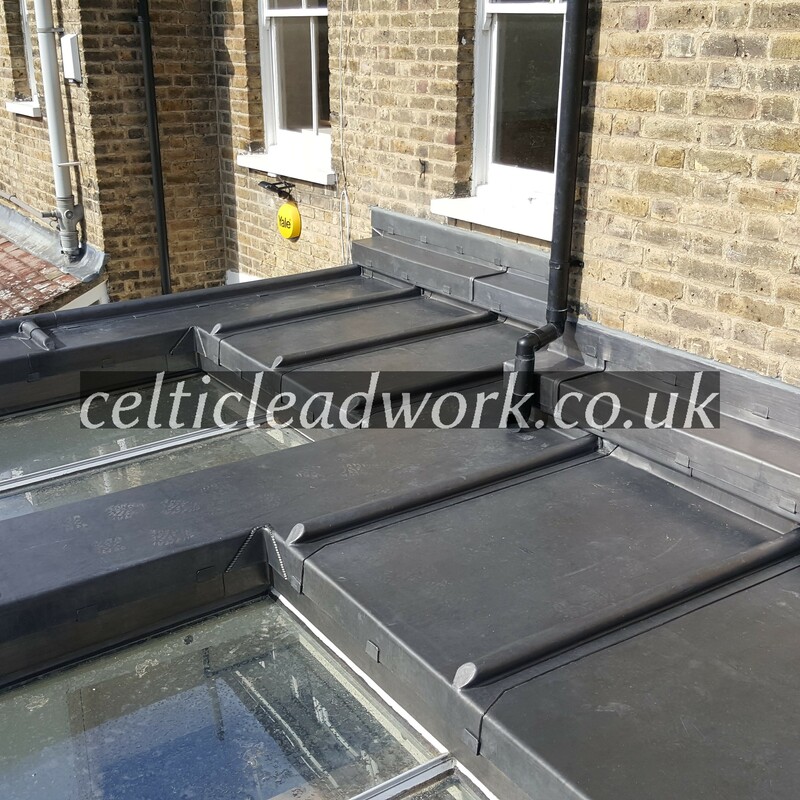 Flat Lead Roof – code 5, 6 & 8 Kensington High Street, London Open roof is code 8 with step lead flat bays. 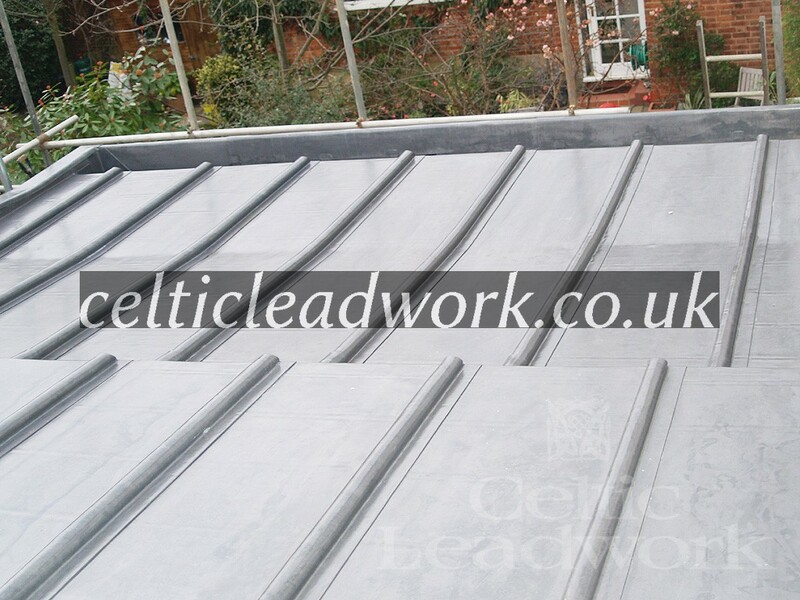 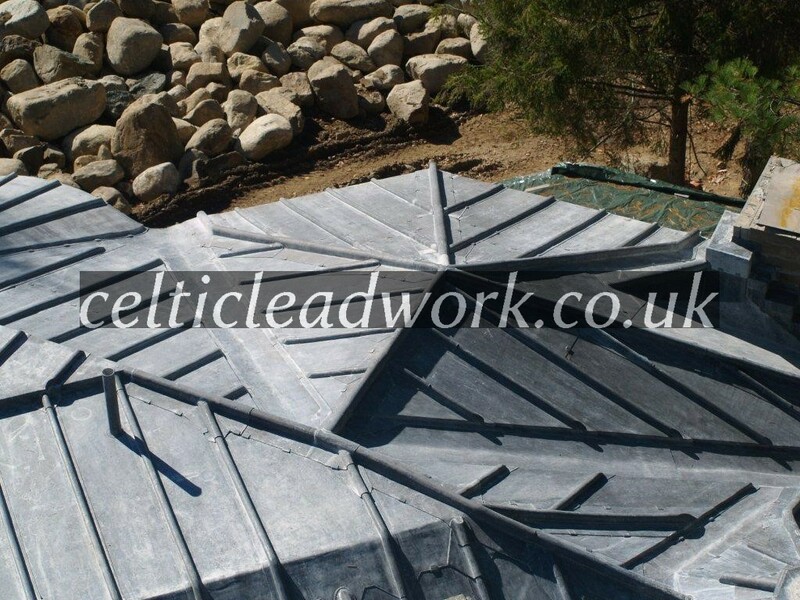 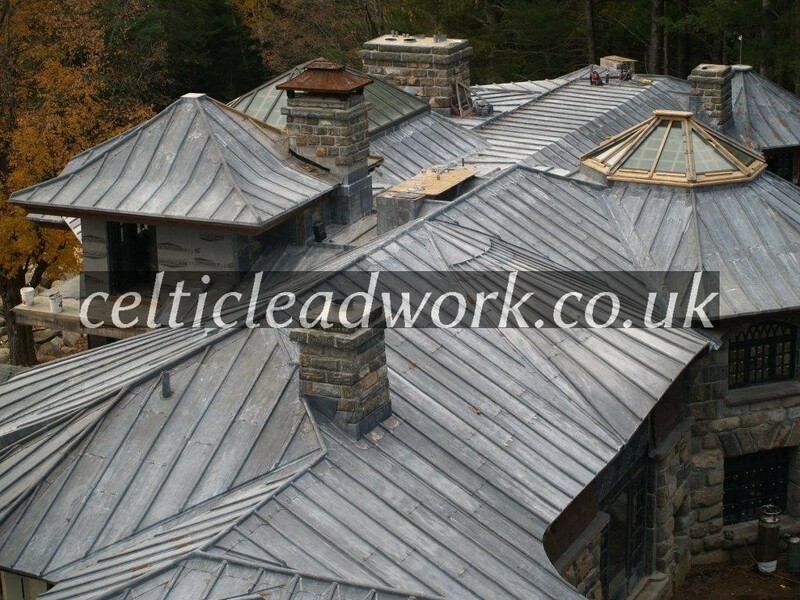 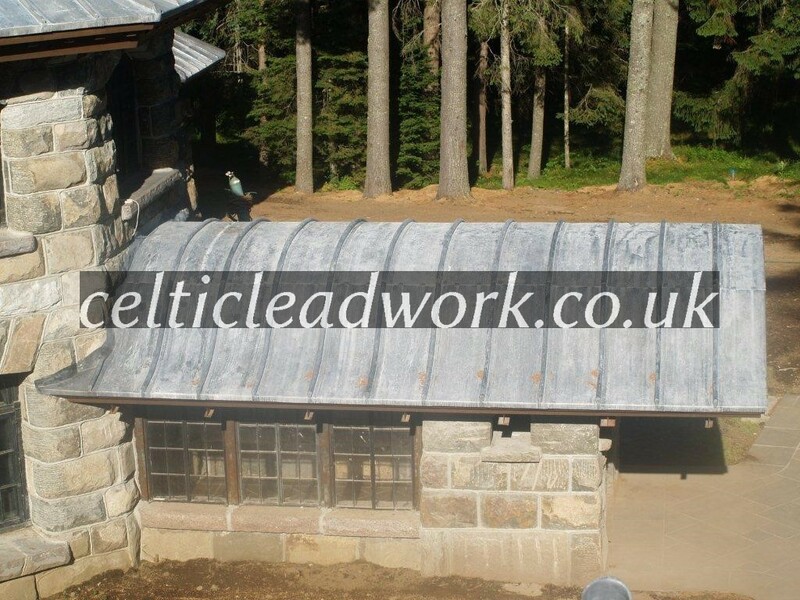 Enclosed roof area is code 6 lead flat bay with code 5 cover flashings bossed roll ends and lead burnt cappings. 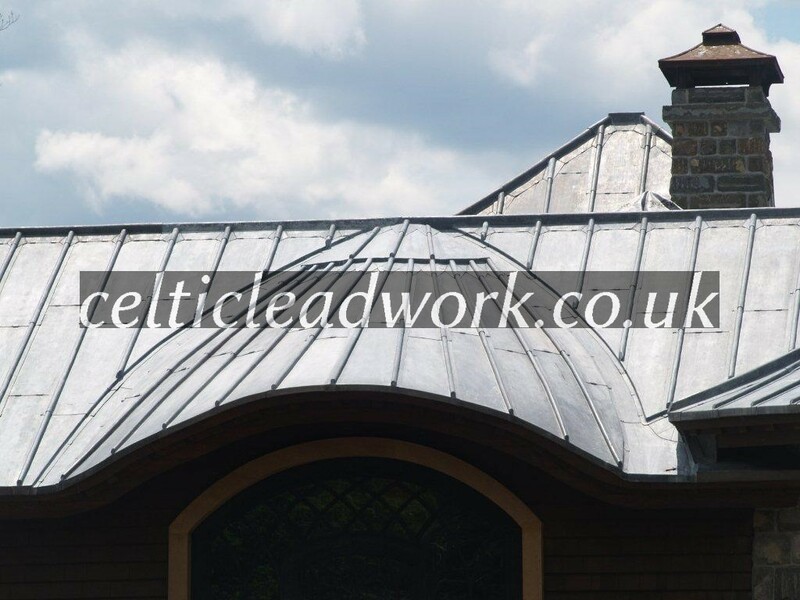 Convex lead roofing – code 6 Conservatory in Enfield . 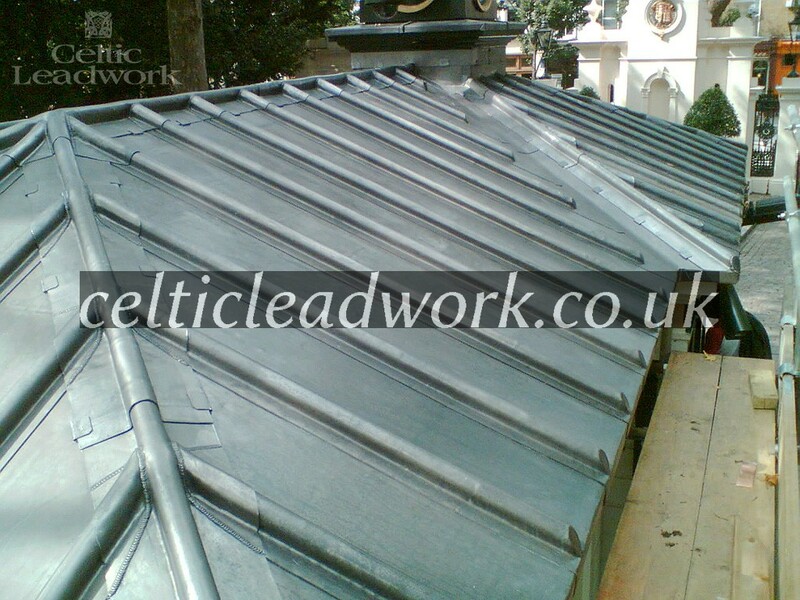 Created a convex lead roof for conservatory at private house installation. 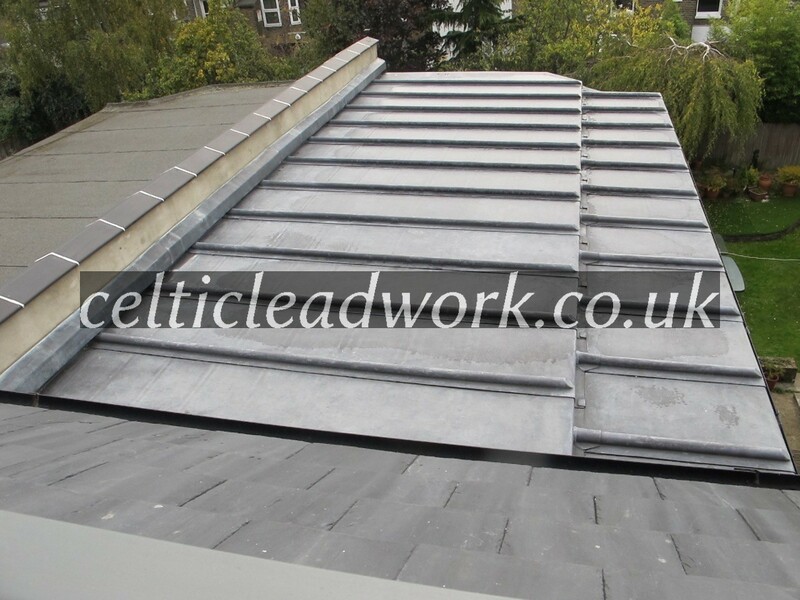 Flat Staggered roof Chiswick, London. 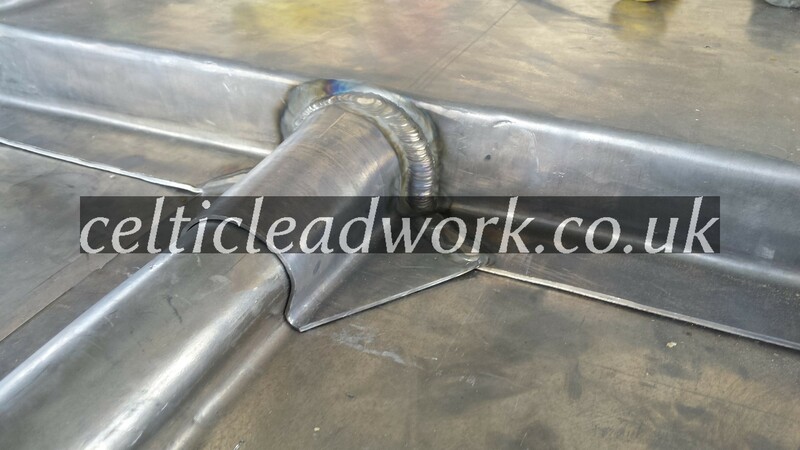 Some more detail about construction, welds and finish. 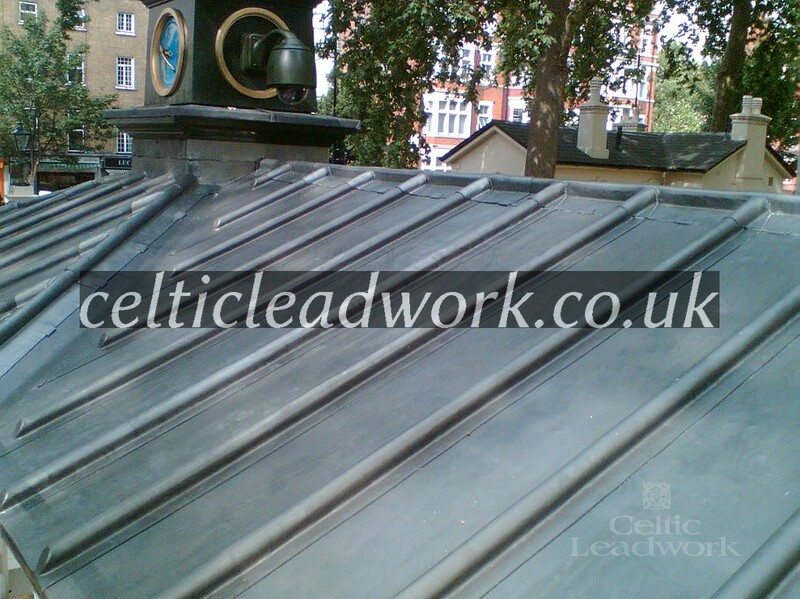 Lead pitch roof – Code 5 Clock house, Kensington, London. 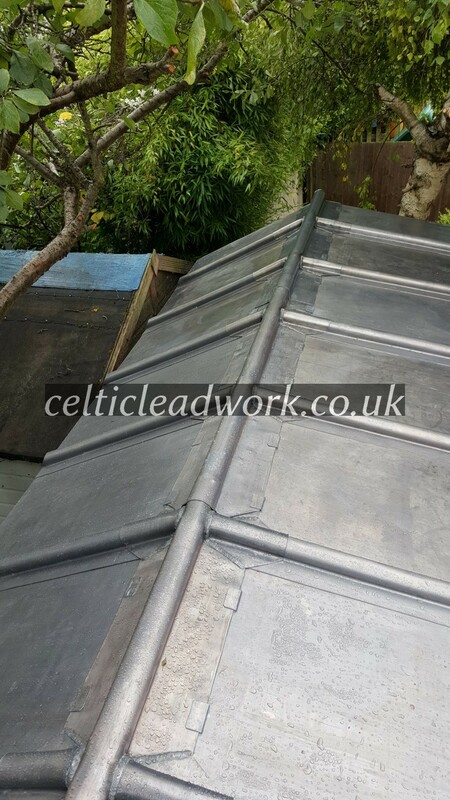 A pitched lead roofing, bossed and lead welded with caps to ridges. 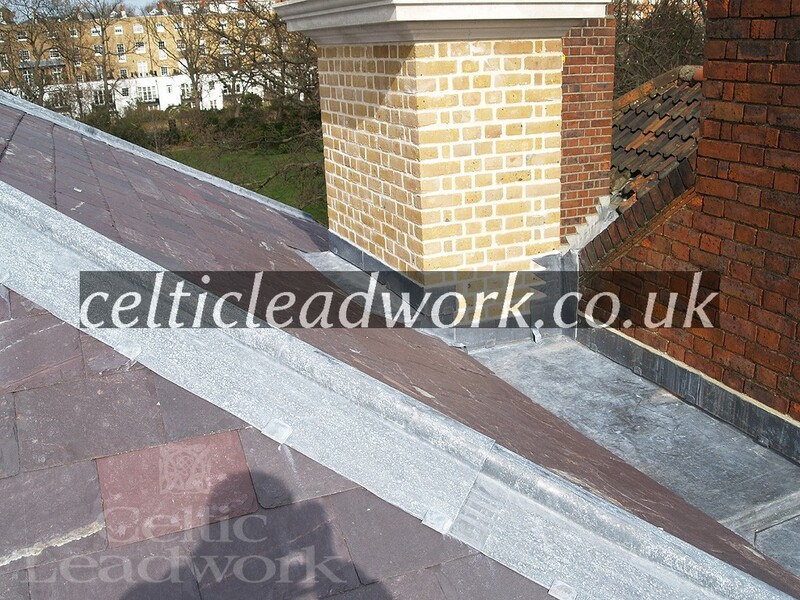 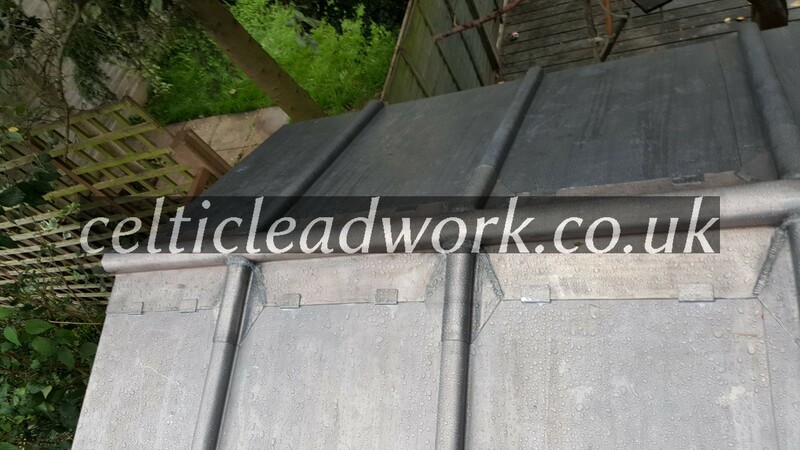 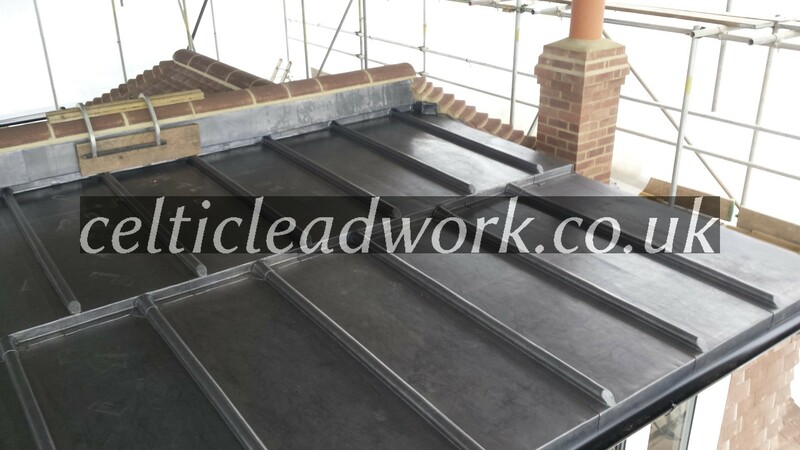 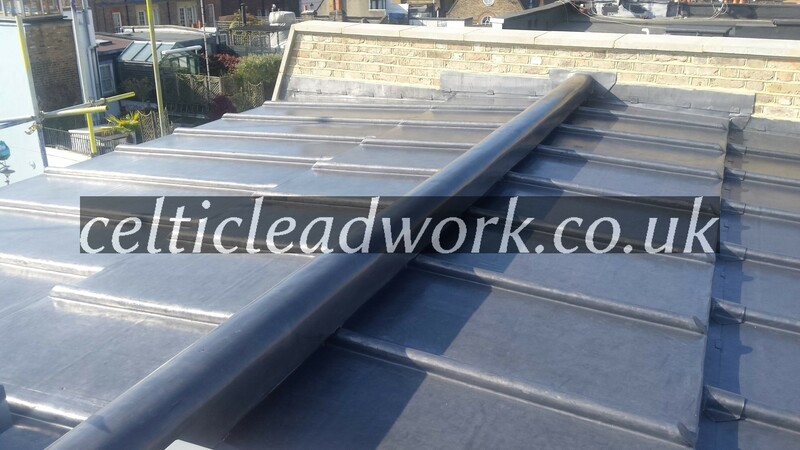 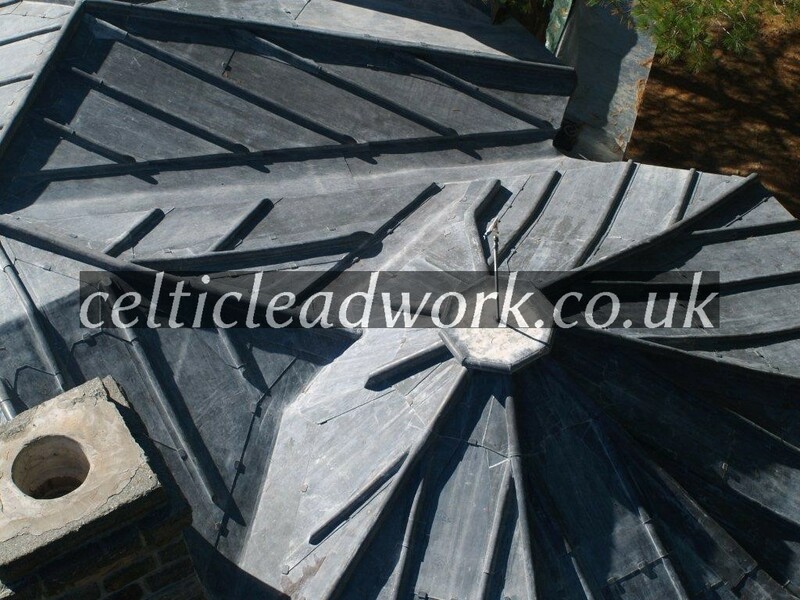 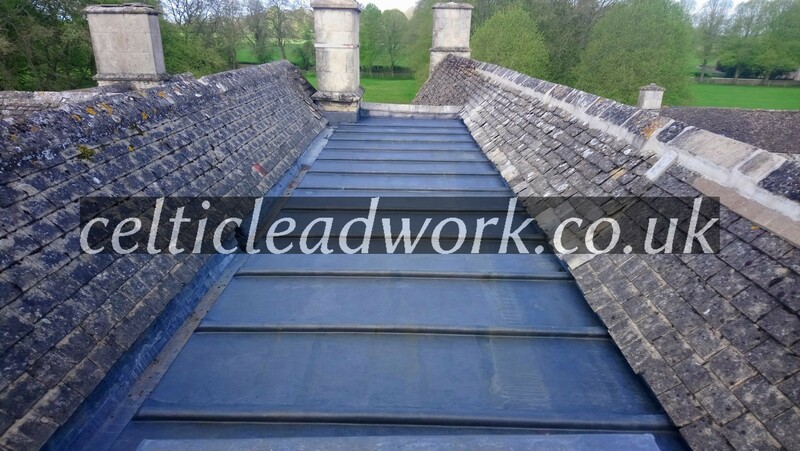 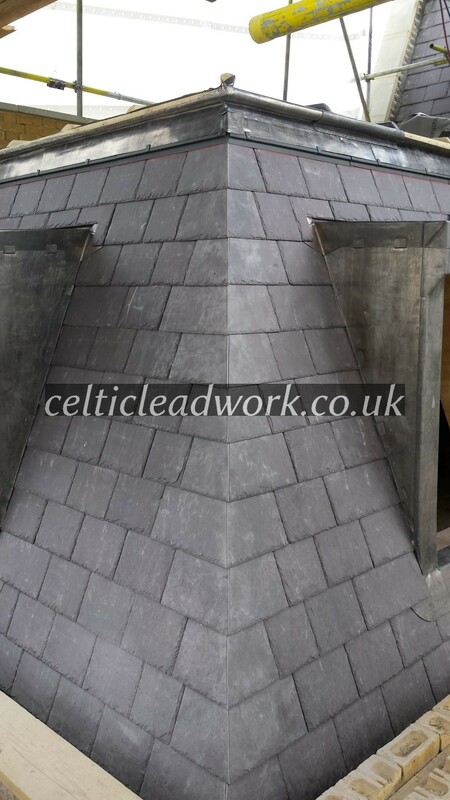 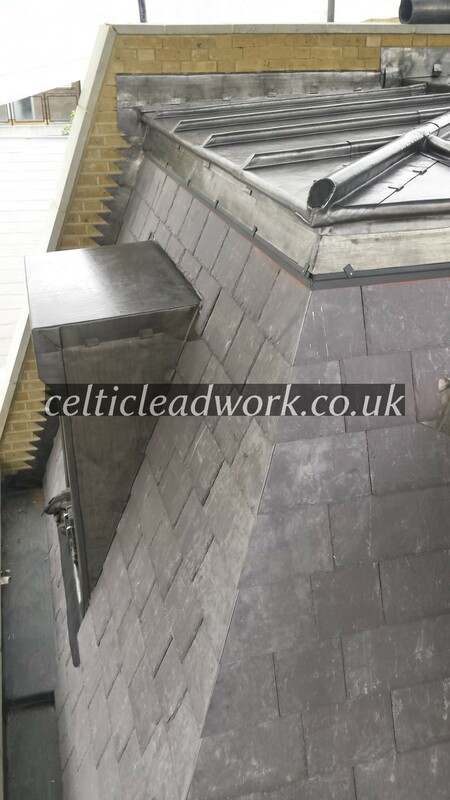 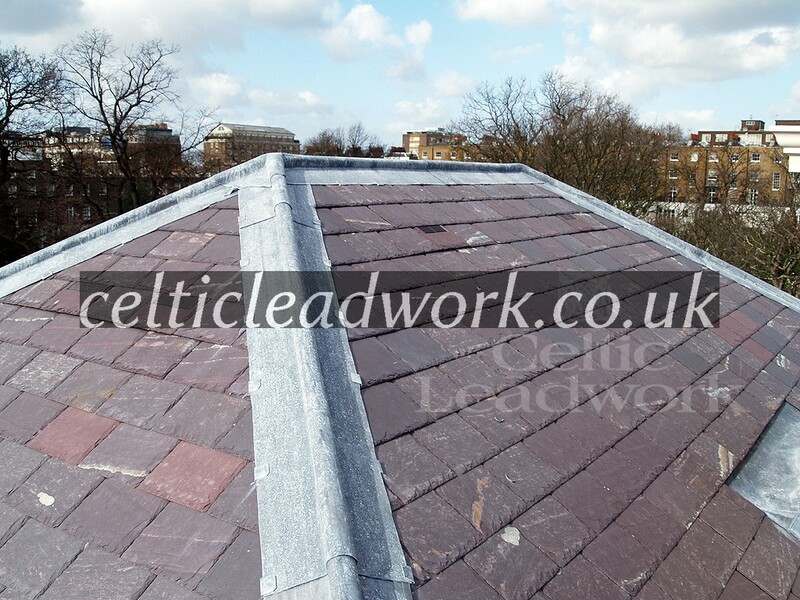 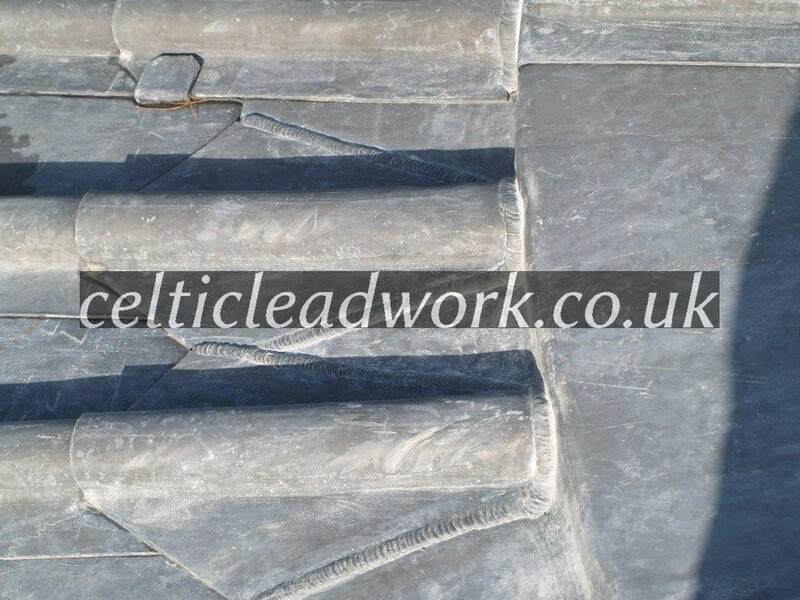 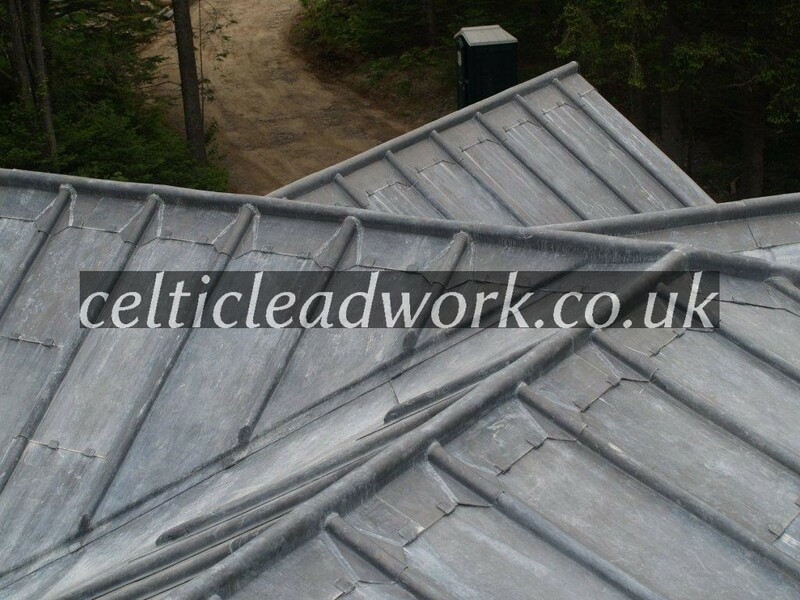 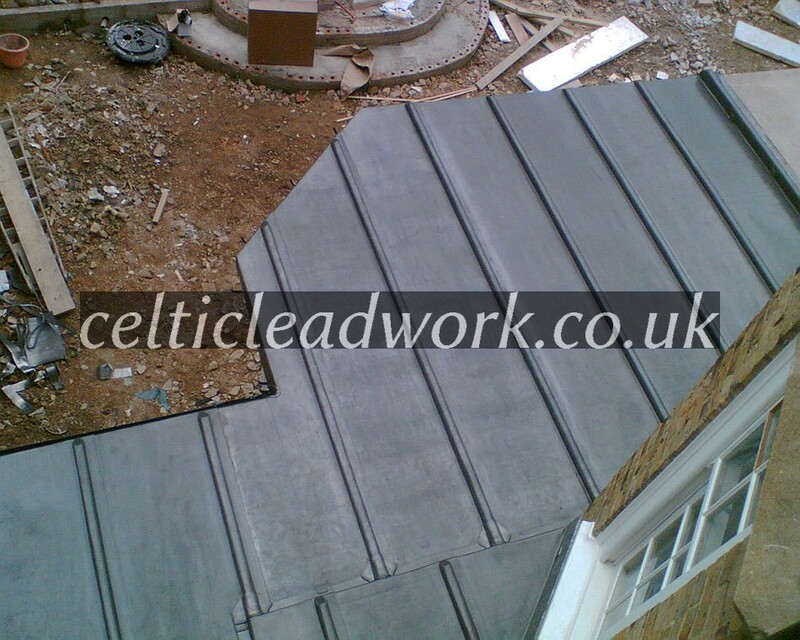 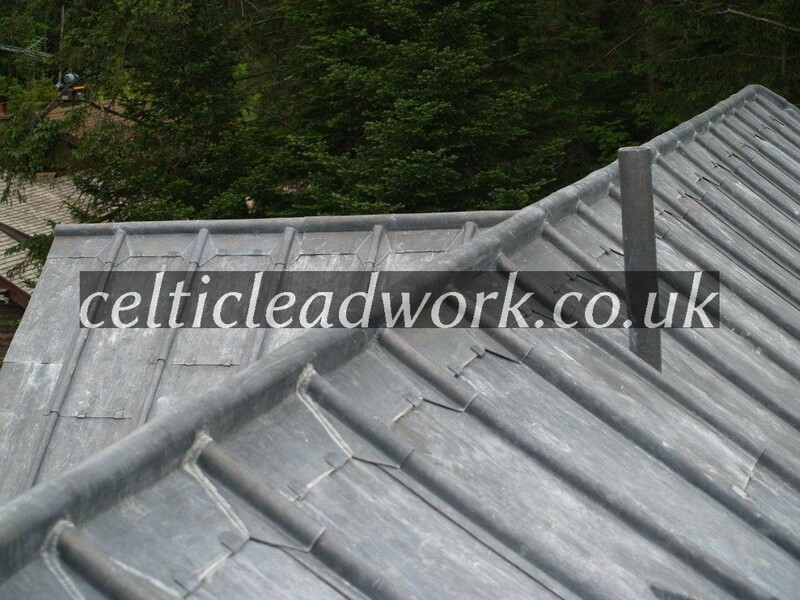 Slate roofing with lead hips – code 5 Kensington, London. 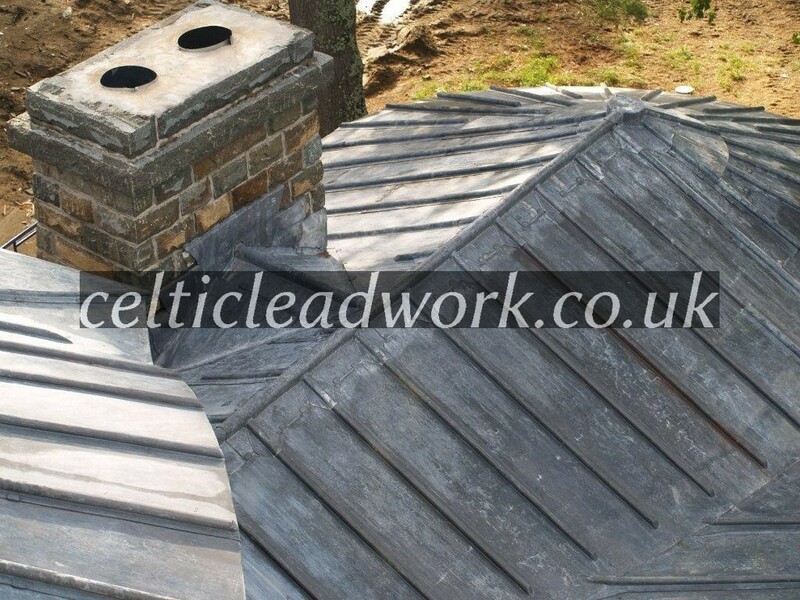 Completed with Welsh hand-made tiles, lead hips, lead back gutters and lead steps around the chimney stack. 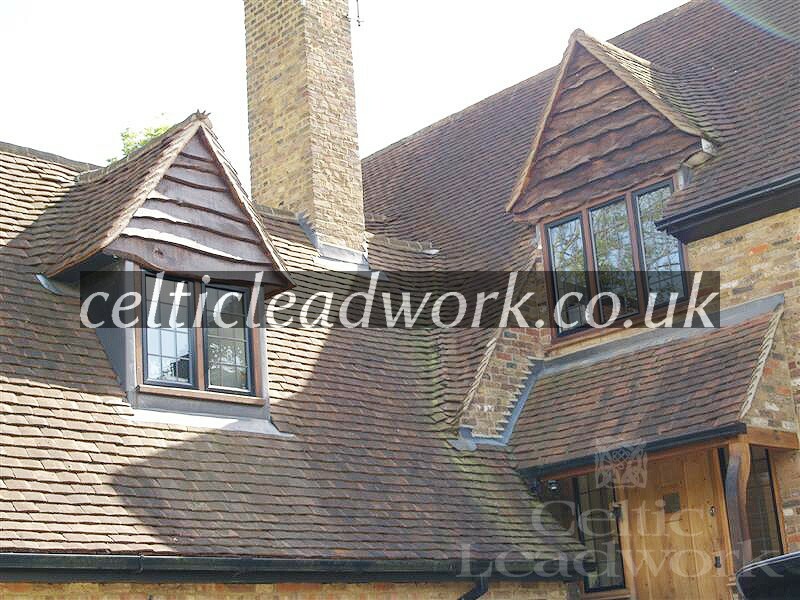 Clockhouse – code 5 Moor Park, Hertfordshire. 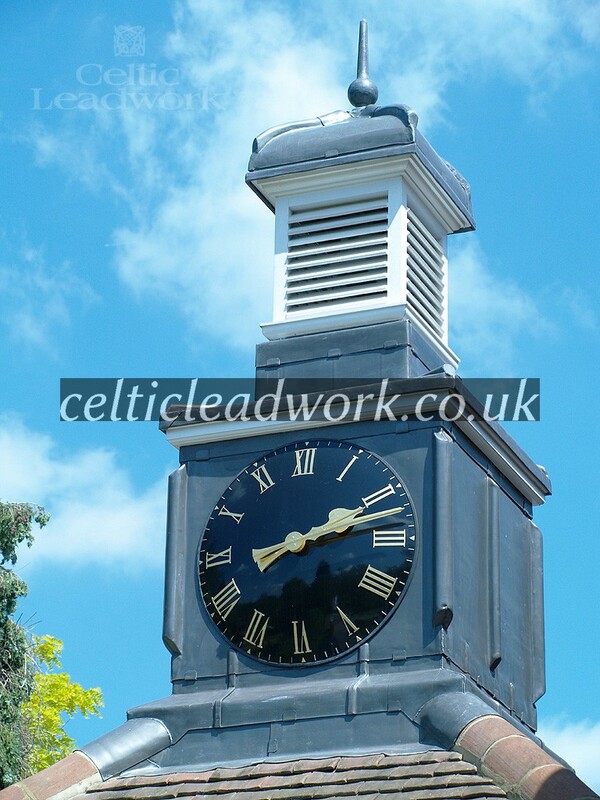 Clock tower, vertical cladding with king wood roll. 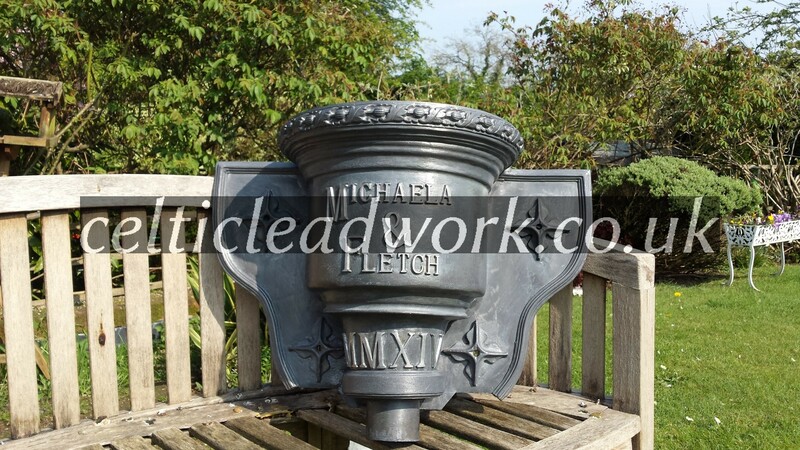 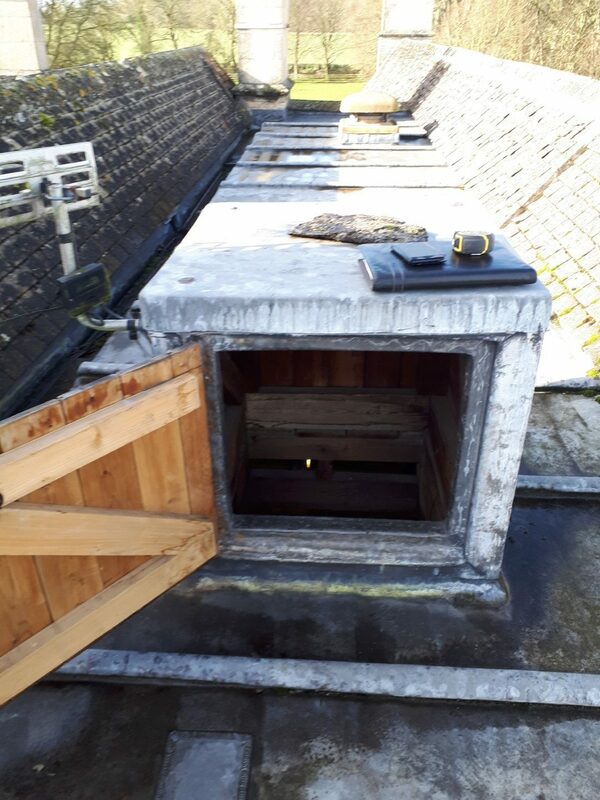 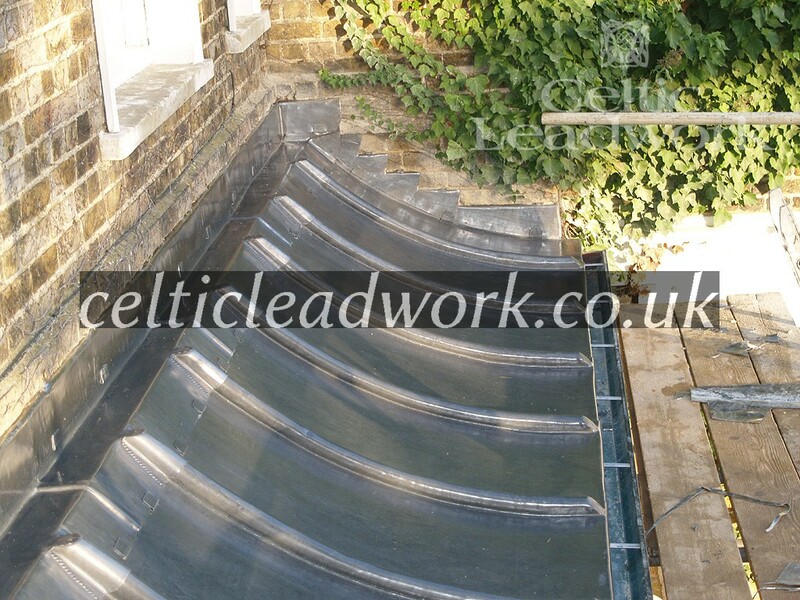 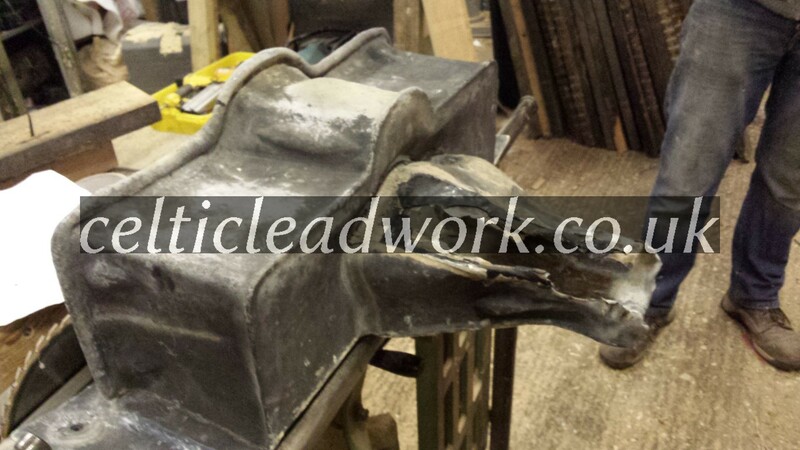 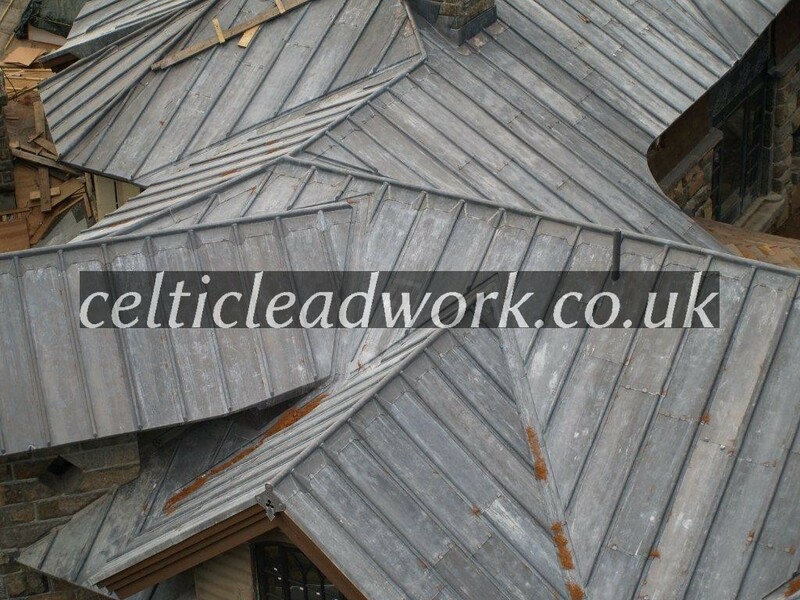 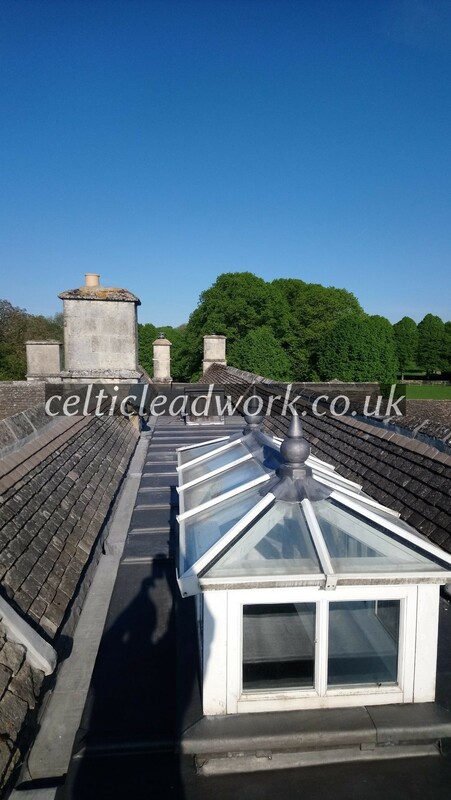 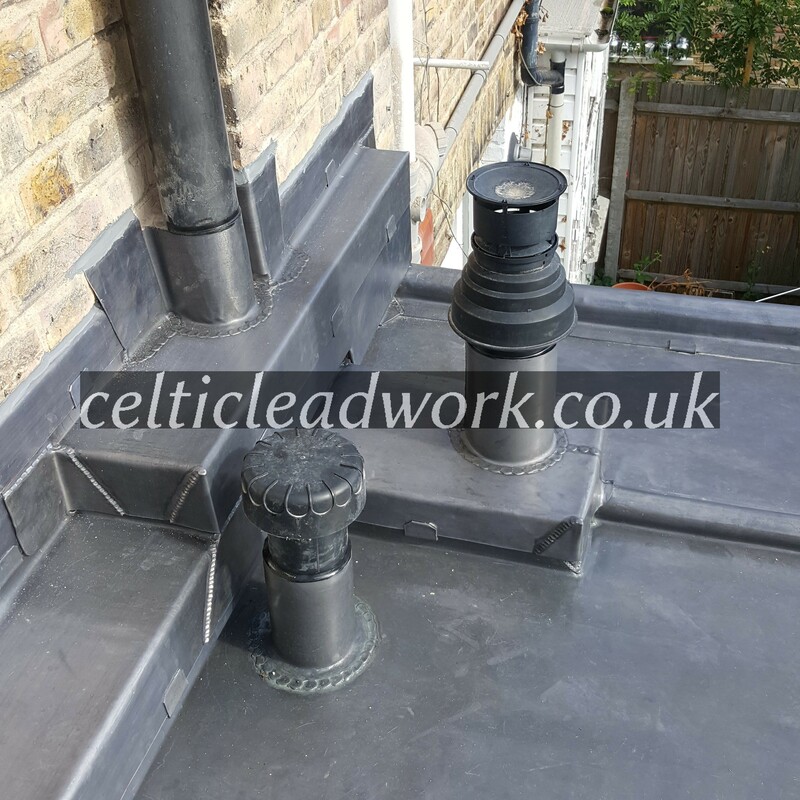 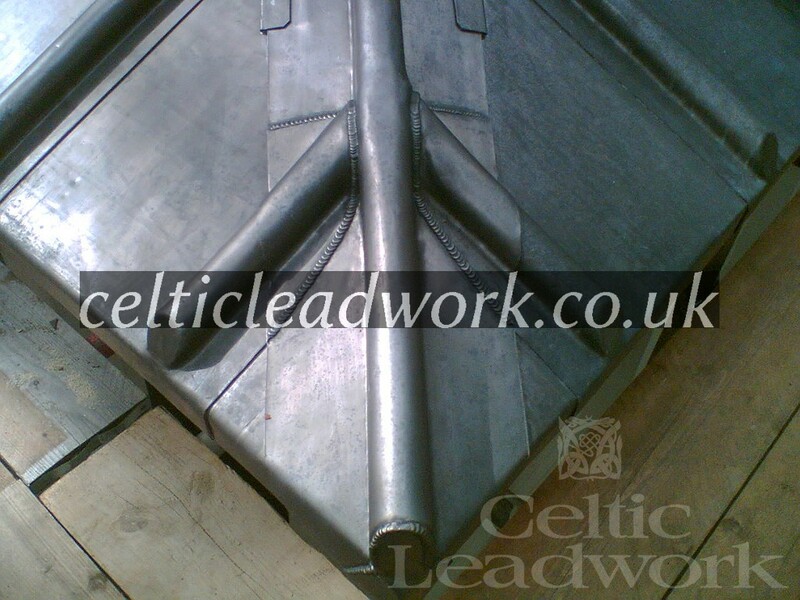 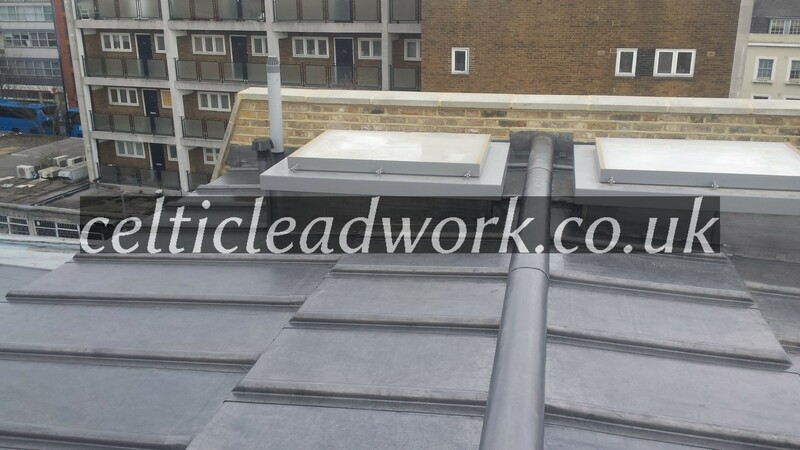 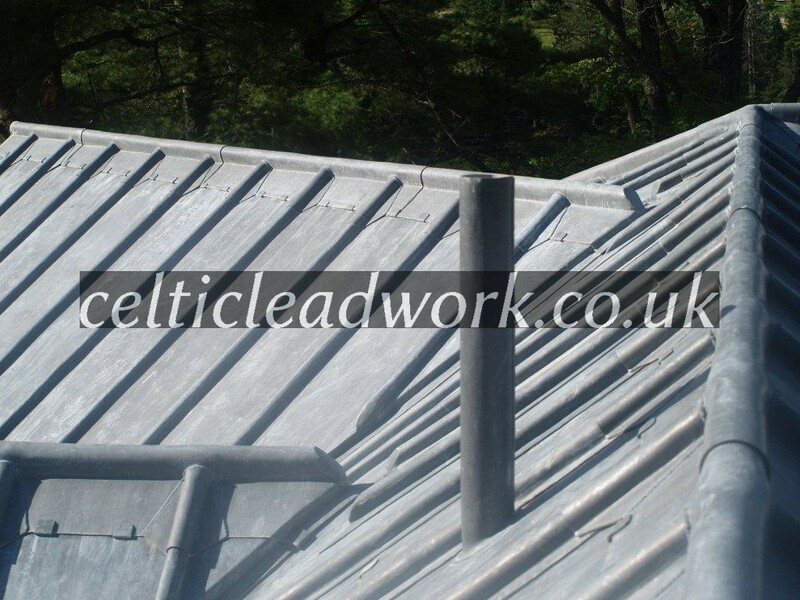 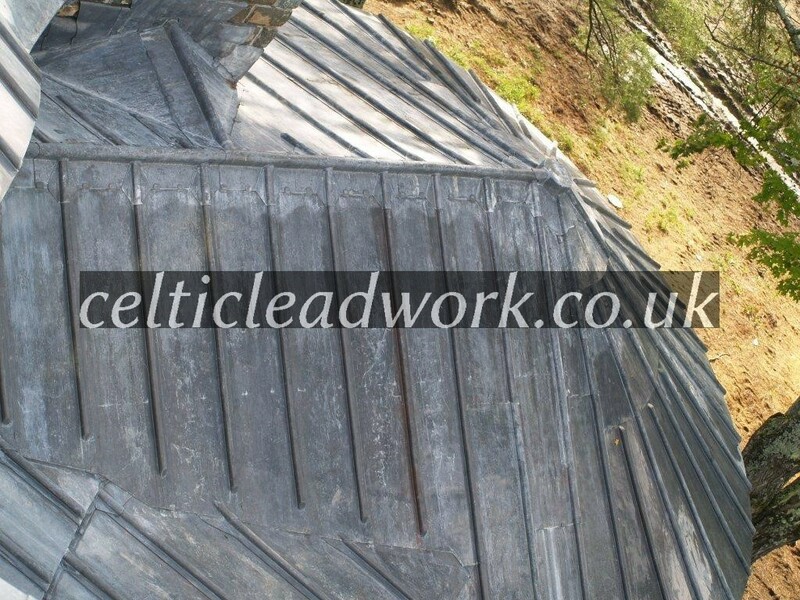 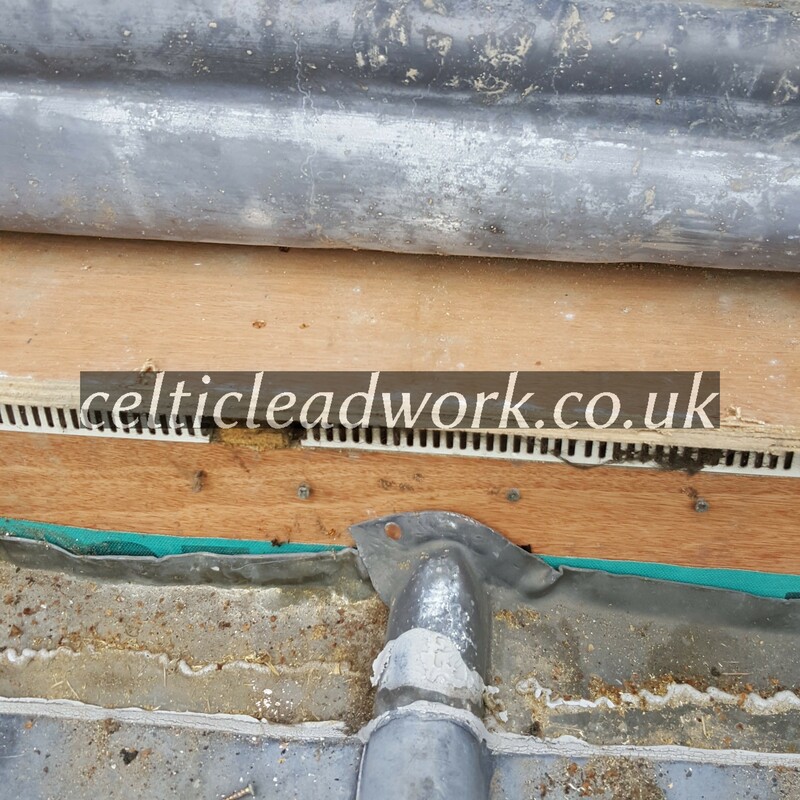 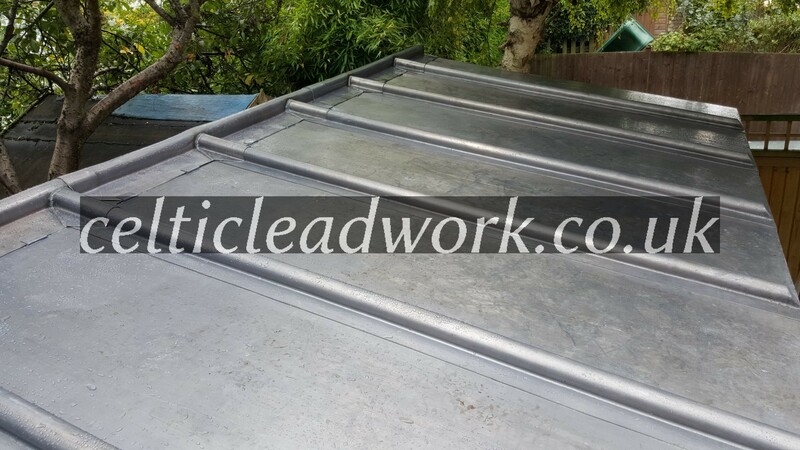 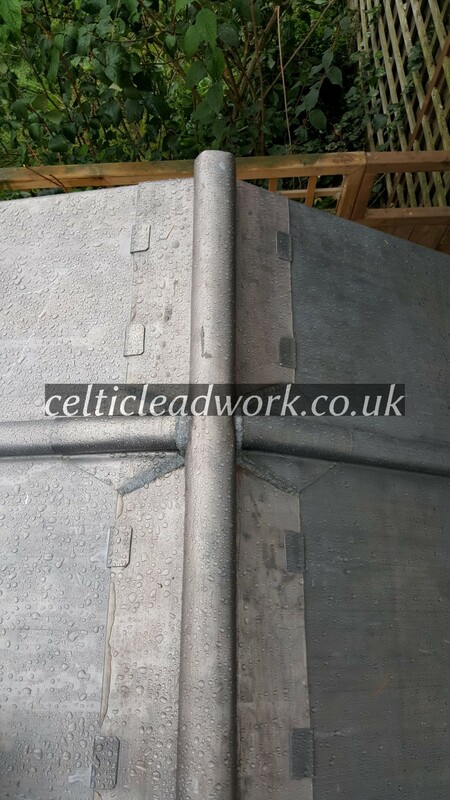 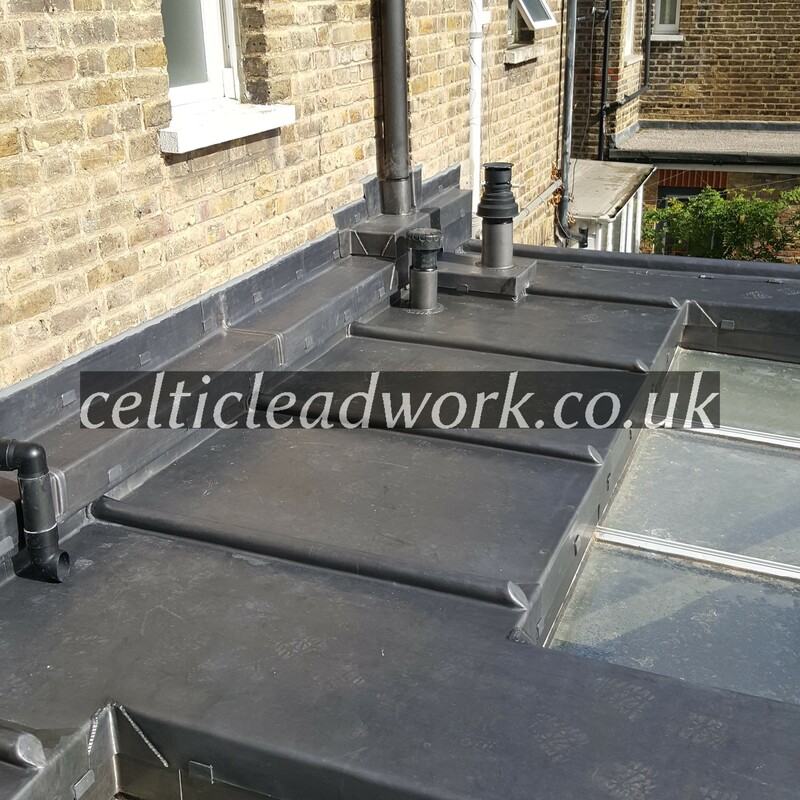 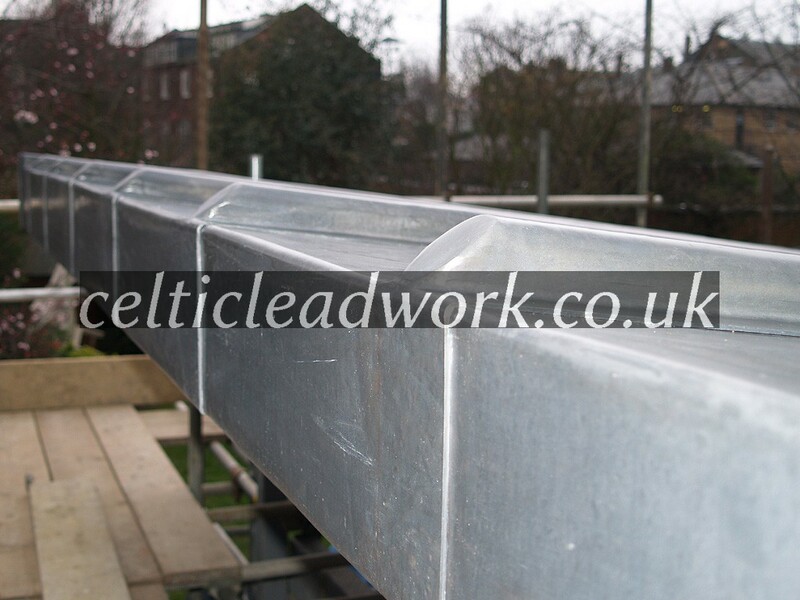 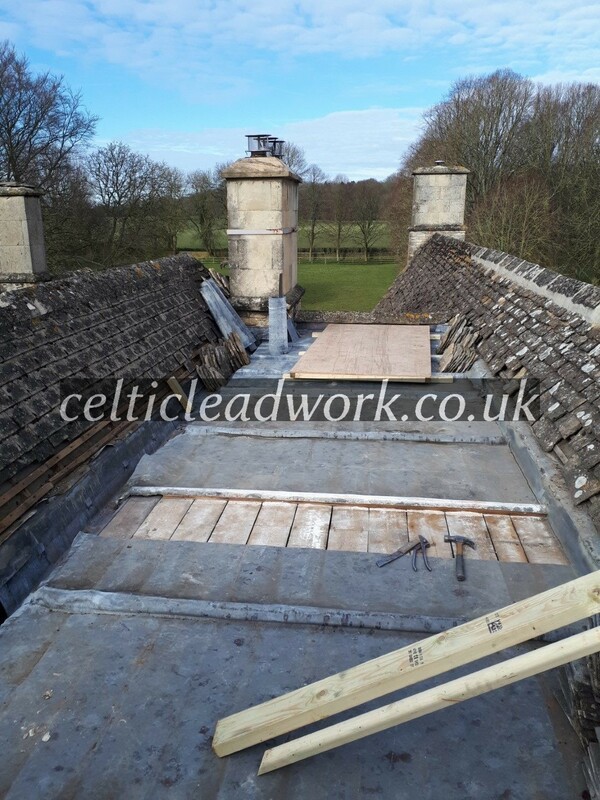 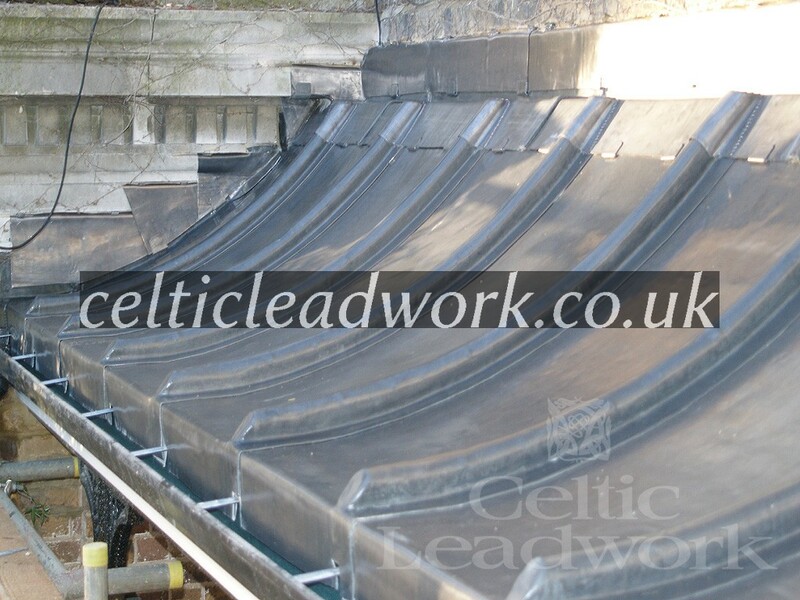 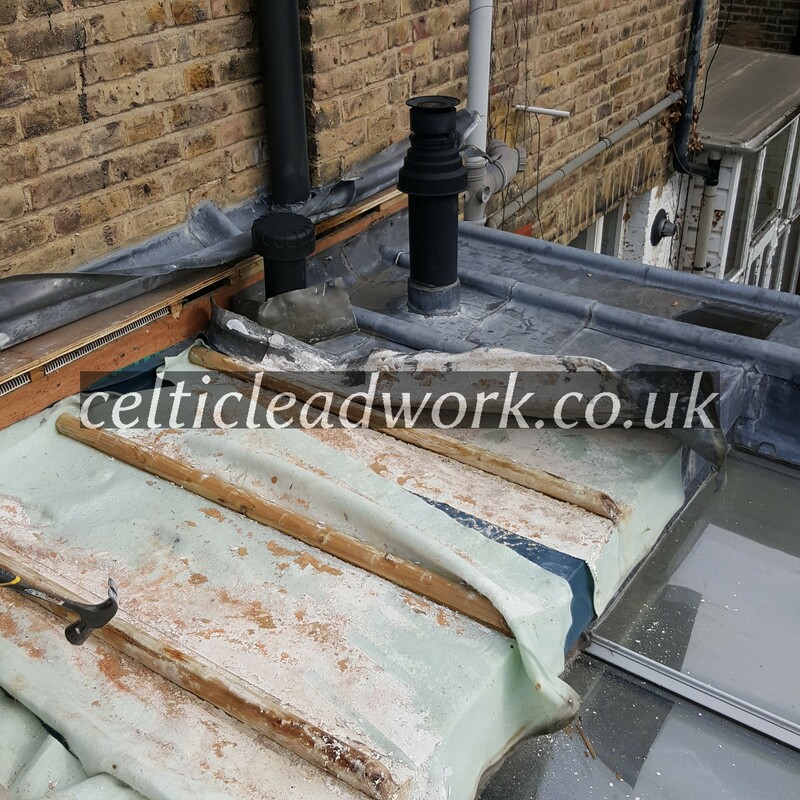 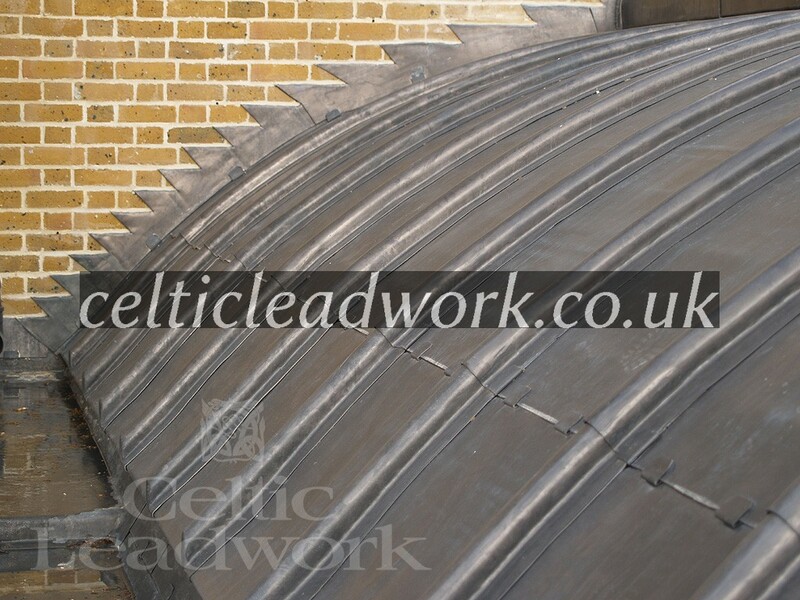 Turret Lead Roof – code 6 Chelsea, London. 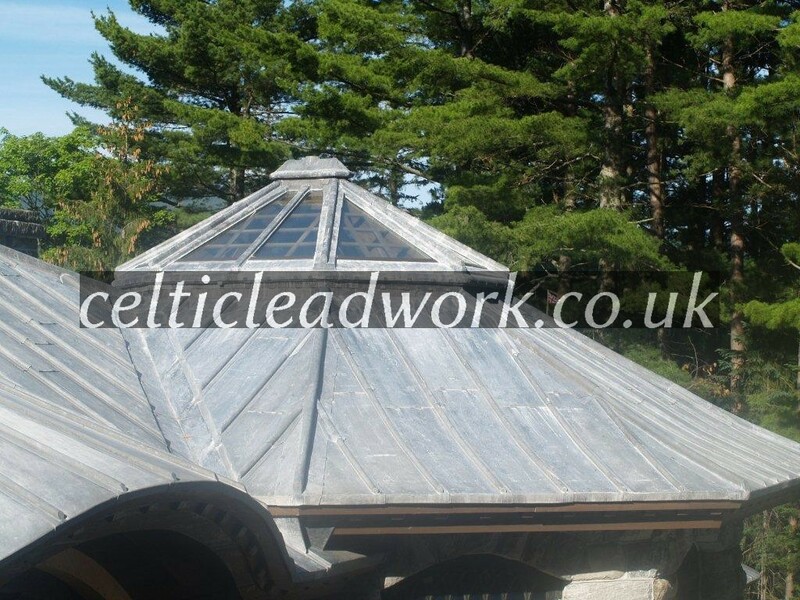 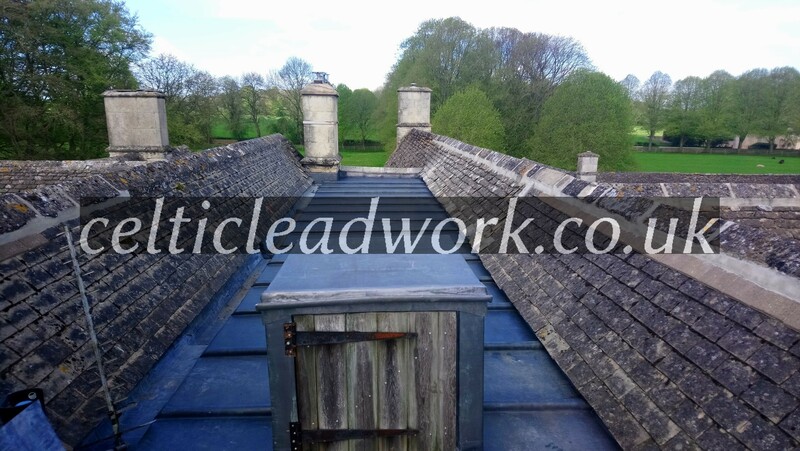 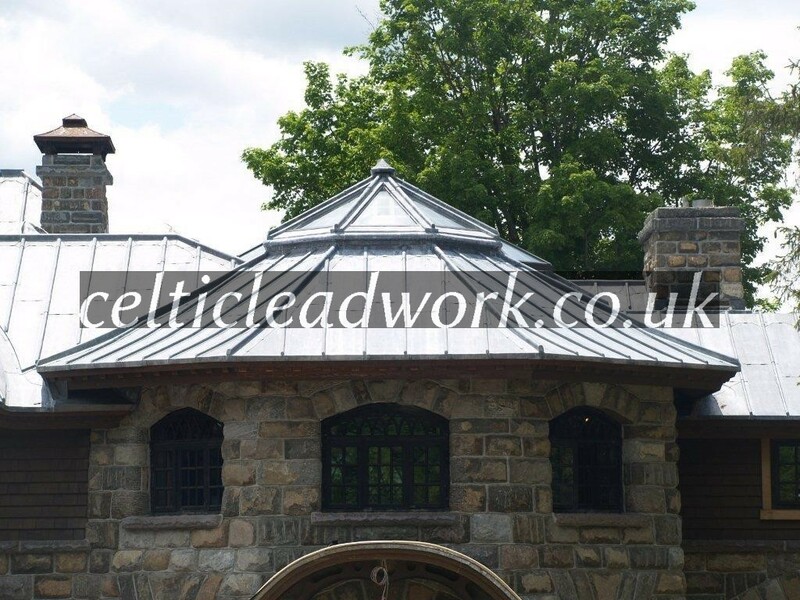 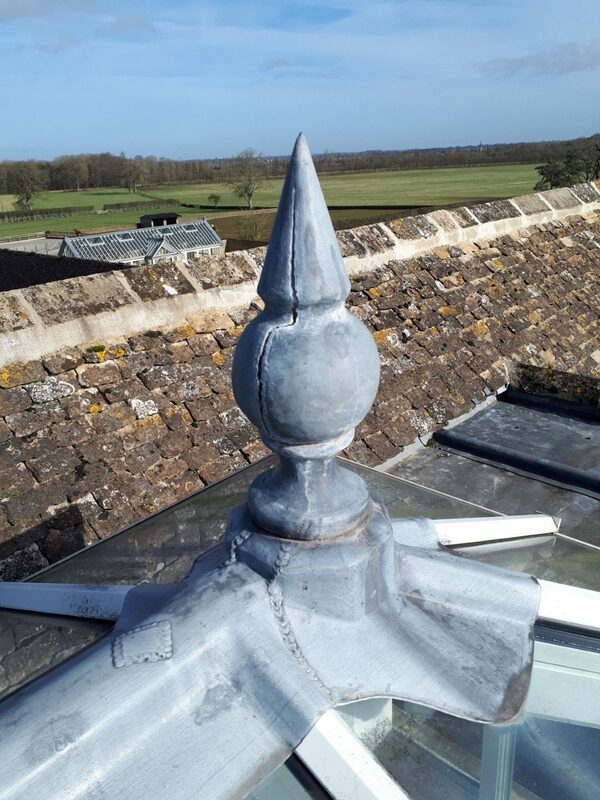 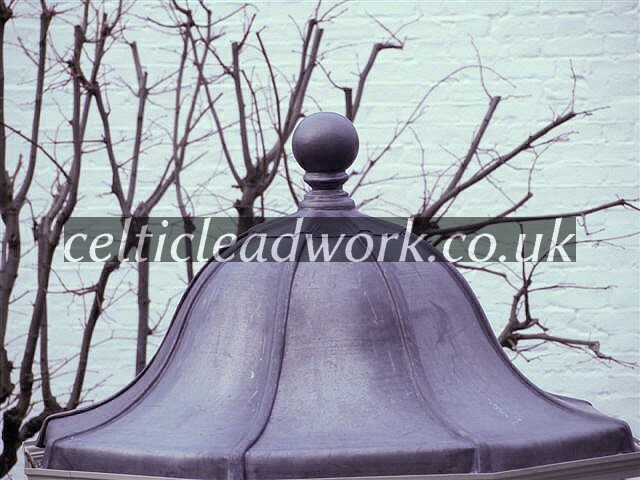 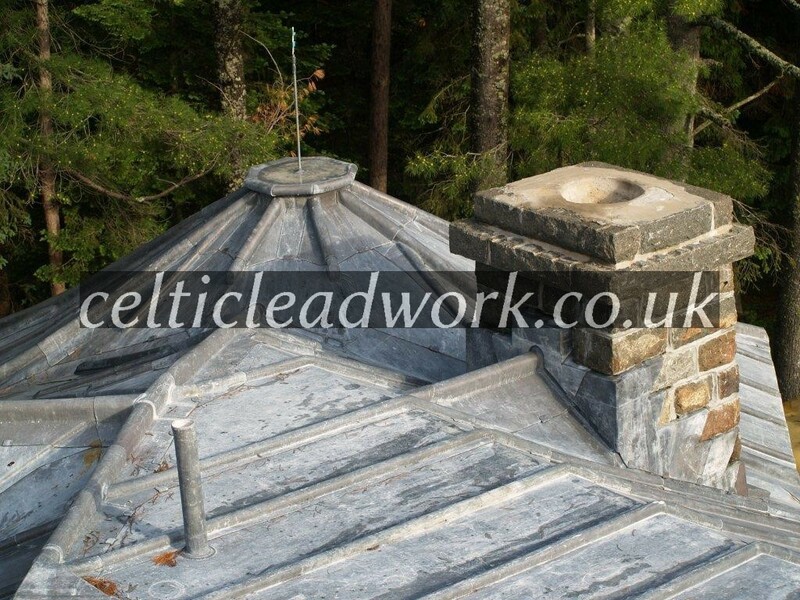 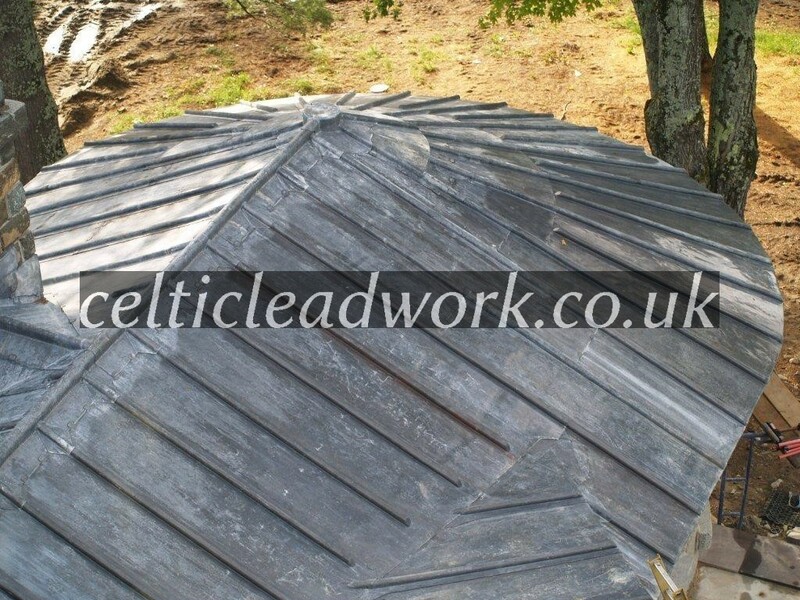 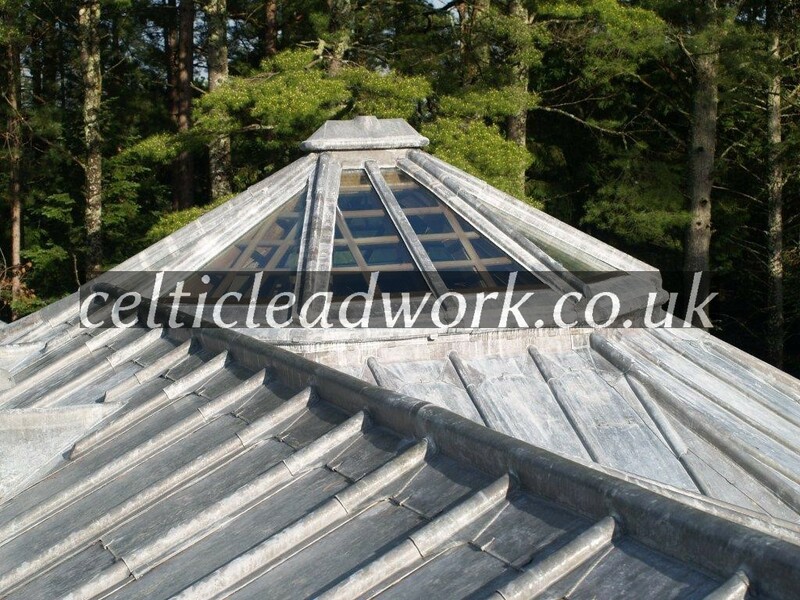 Octagonal Lead roof with welted panels and a bossed lead ball. 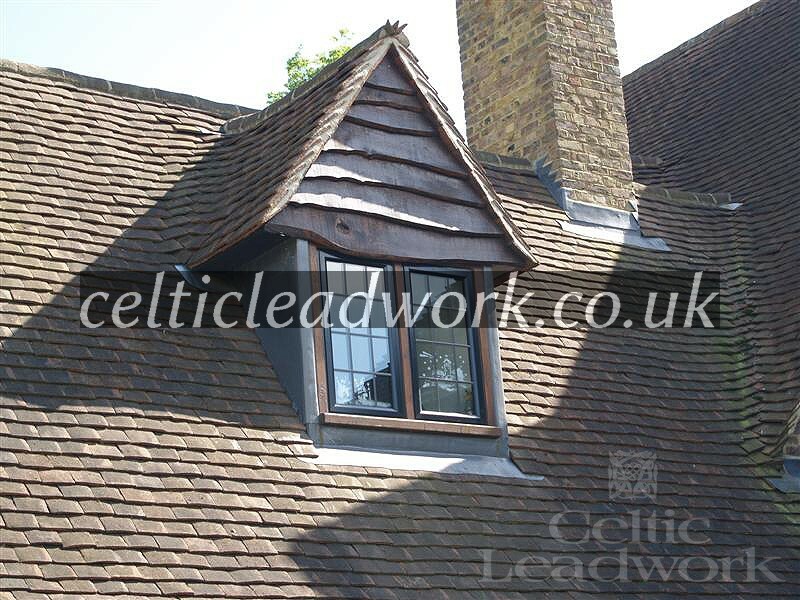 Tiled roof with lead dormers Pinner, North London. 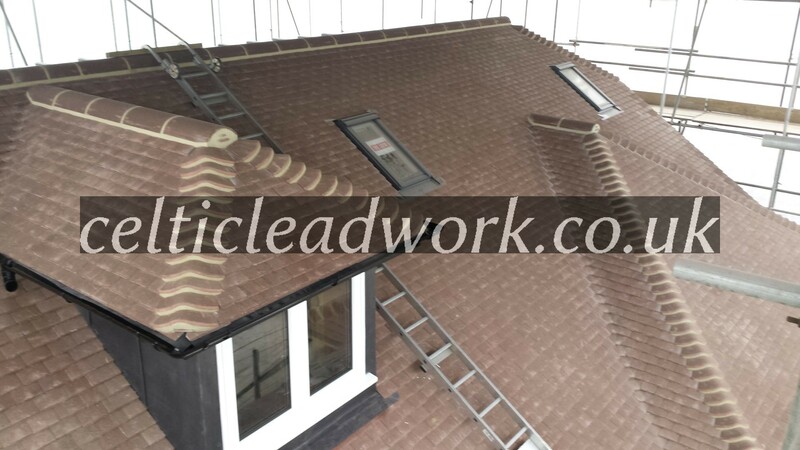 New build private house, with period details and high quality finishes such as the hand made clay tiles, dormer windows and cover and step flashings.